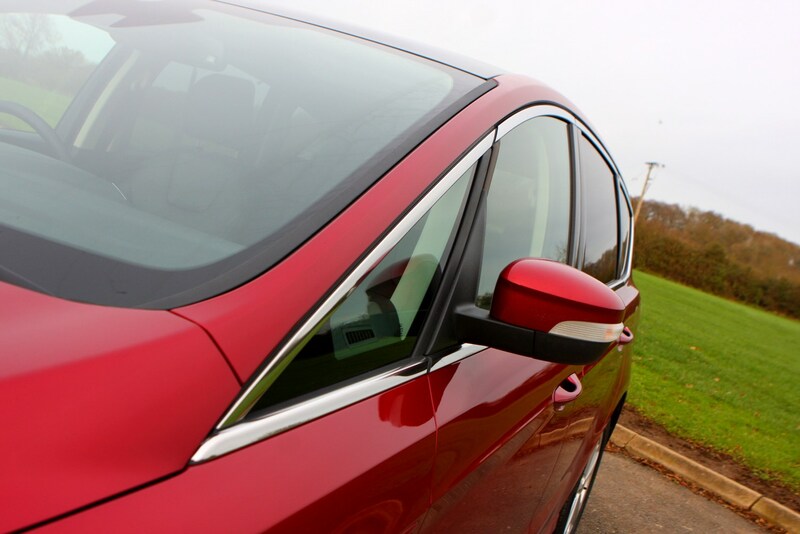 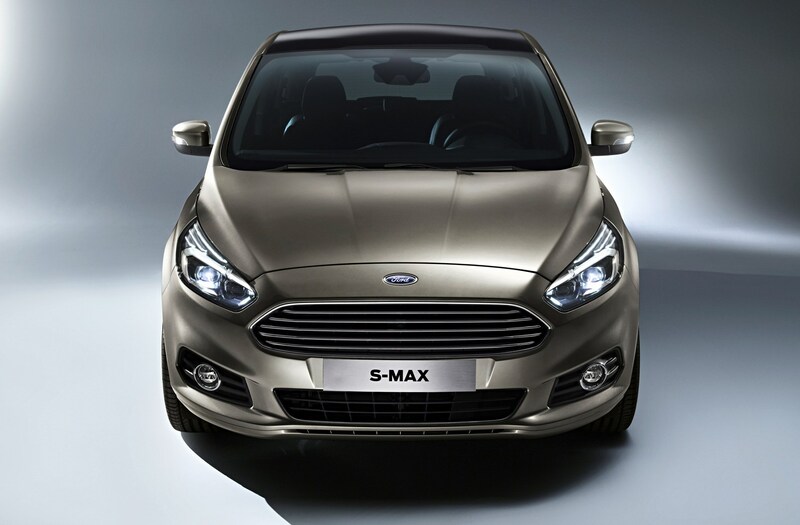 The Ford S-Max has been a roaring success for the Blue Oval since it was introduced in 2006. 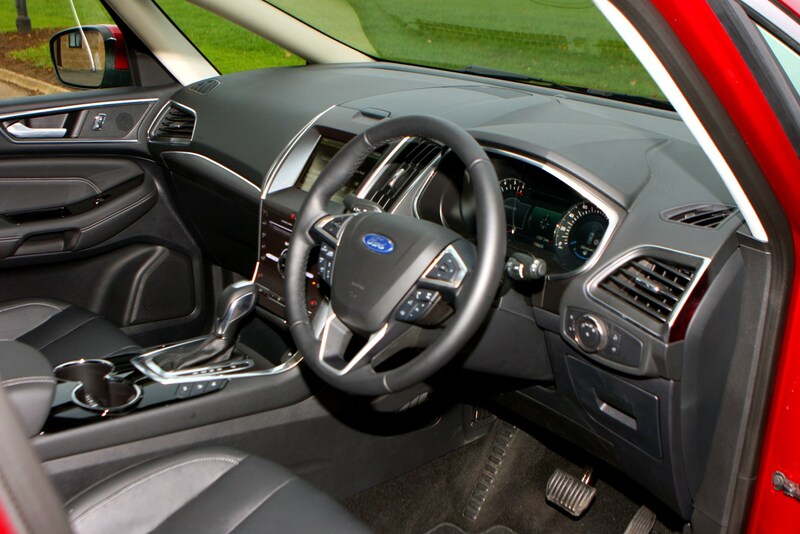 It arrived with a sleek and sporty look (for a people carrier), a great driving experience and appealing interior that contributed to it being named car of the year in 2007. 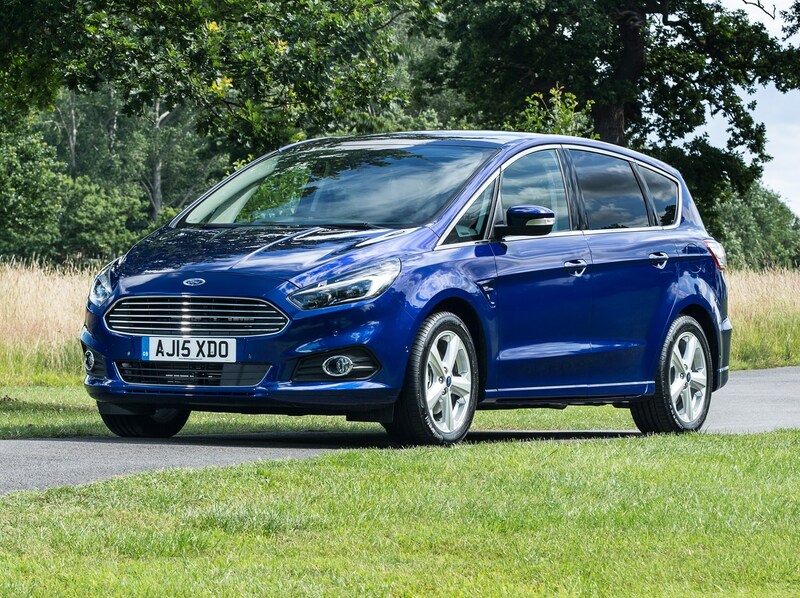 Since then, sales have been strong, despite the proliferation of SUVs, but it remains an excellent choice if you’re looking for a practical seven-seat family car. 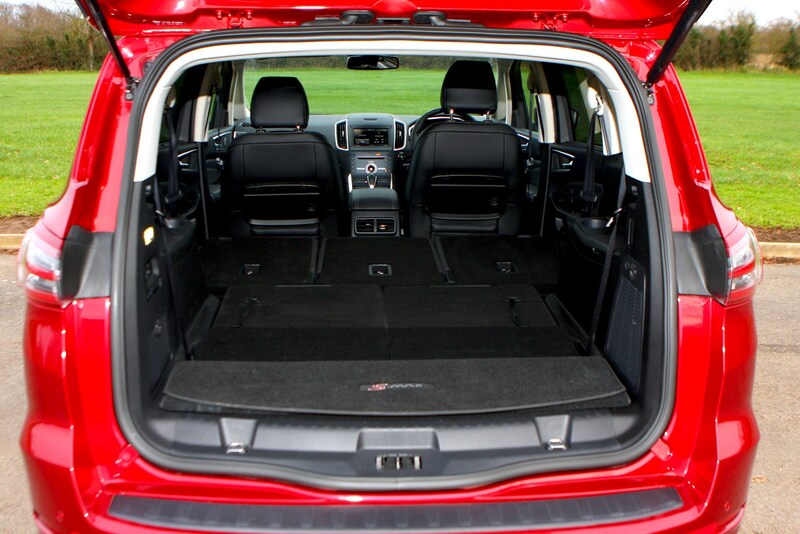 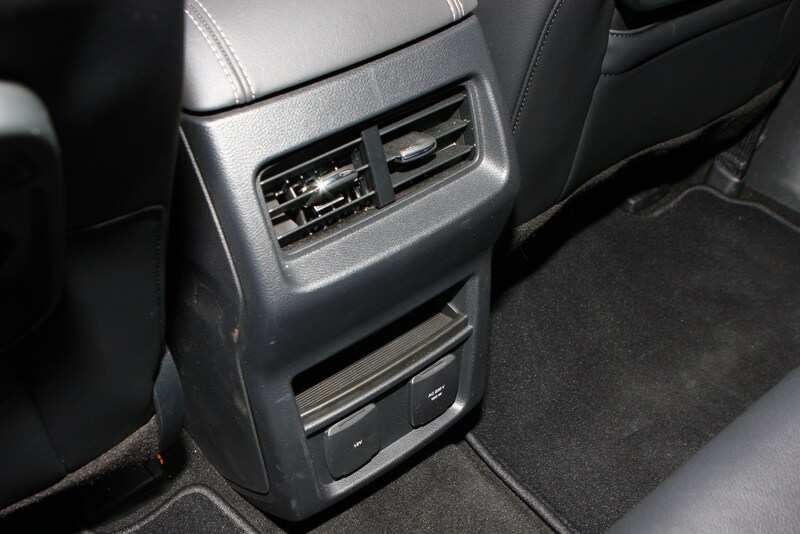 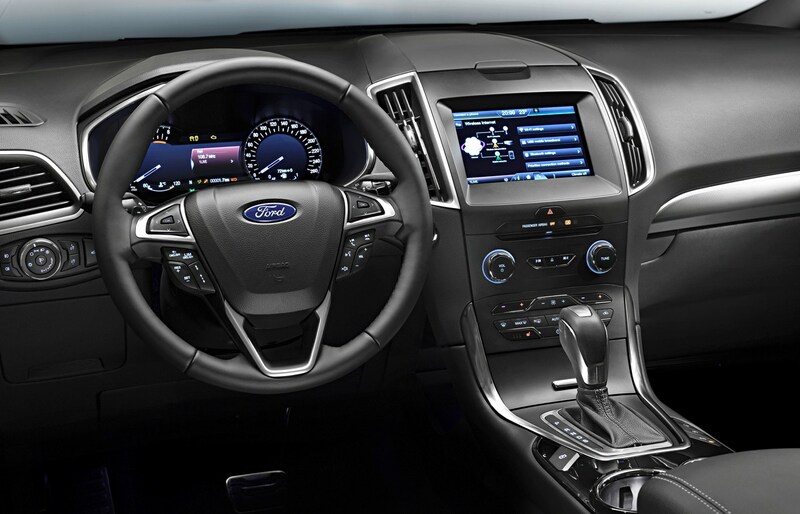 And if you do need more space, Ford will also sell you the larger Galaxy, with a roomier third row of seats. 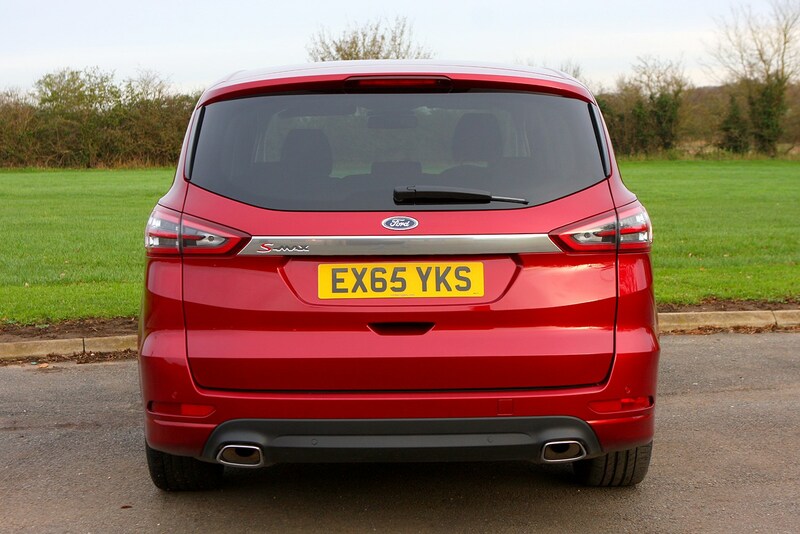 Competition comes in the form of traditional MPV rivals like the Citroen Grand C4 SpaceTourer, Renault Grand Scenic and Volkswagen Touran, but also seven-seat SUVs like the Skoda Kodiaq and Peugeot 5008. 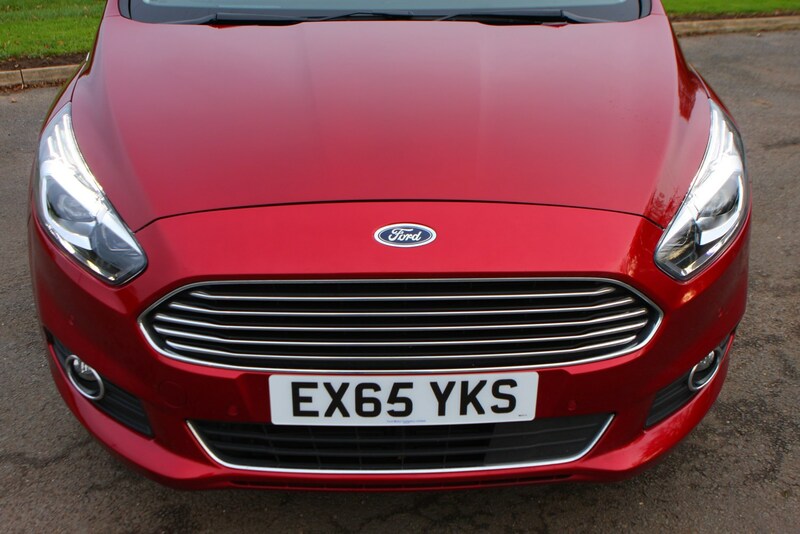 It’s got its work cut out to tempt family buyers. 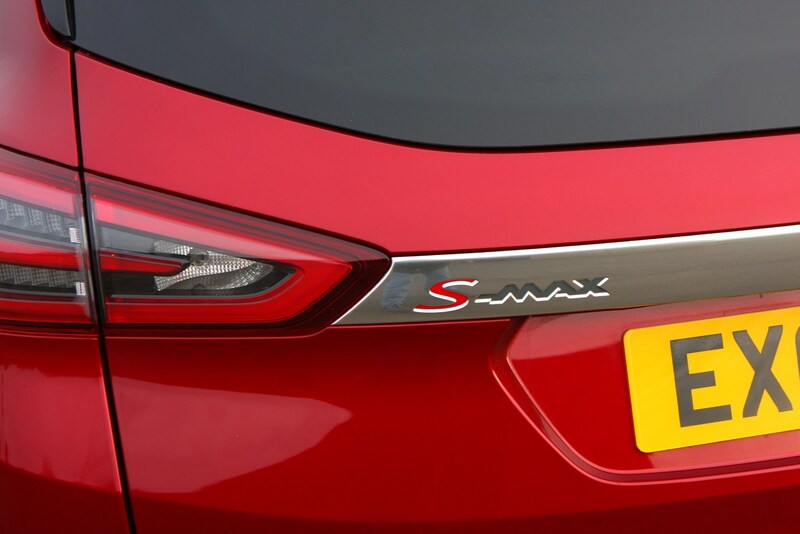 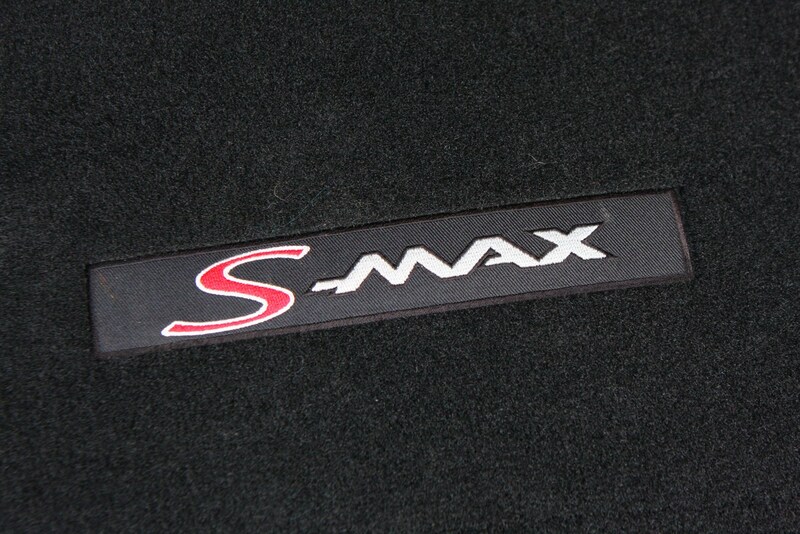 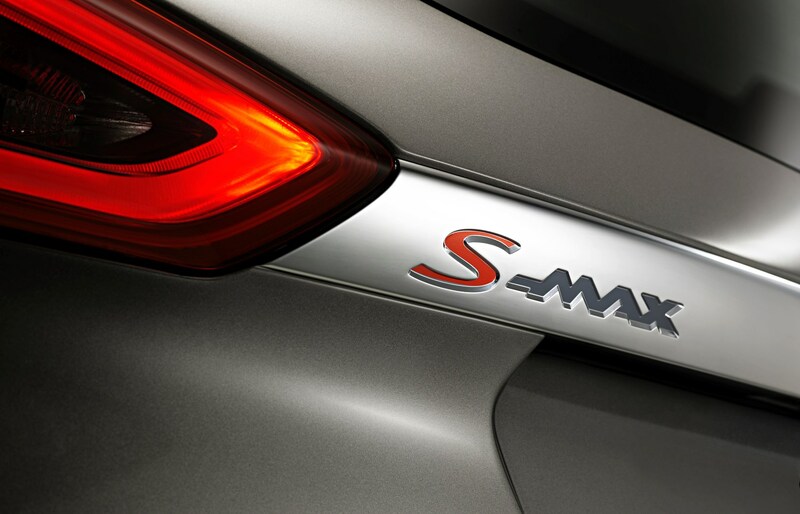 The S-Max comes with a very similar design to the car that came before it. 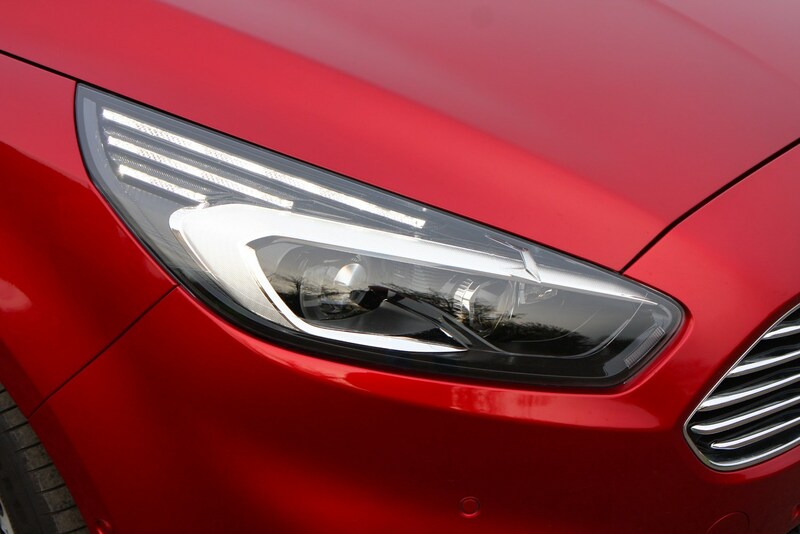 The headlamps have been slimmed down, the windscreen pillars moved further back and the nose features the firm’s latest family look. 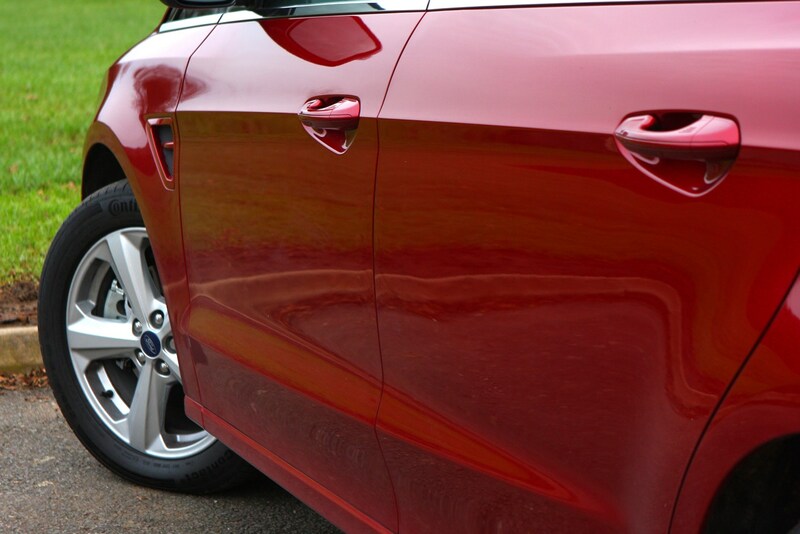 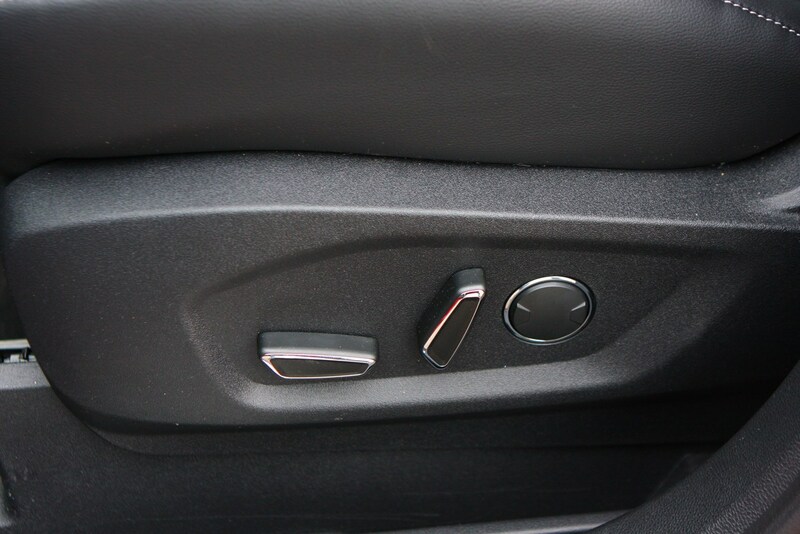 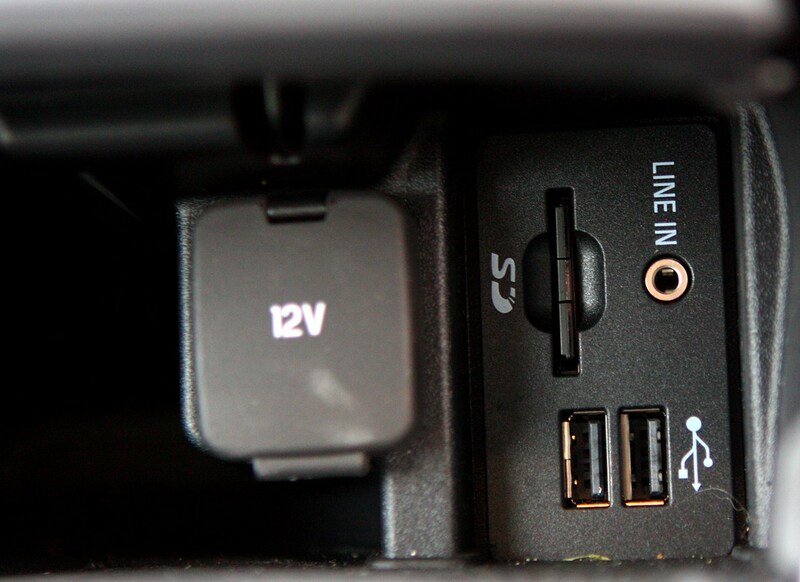 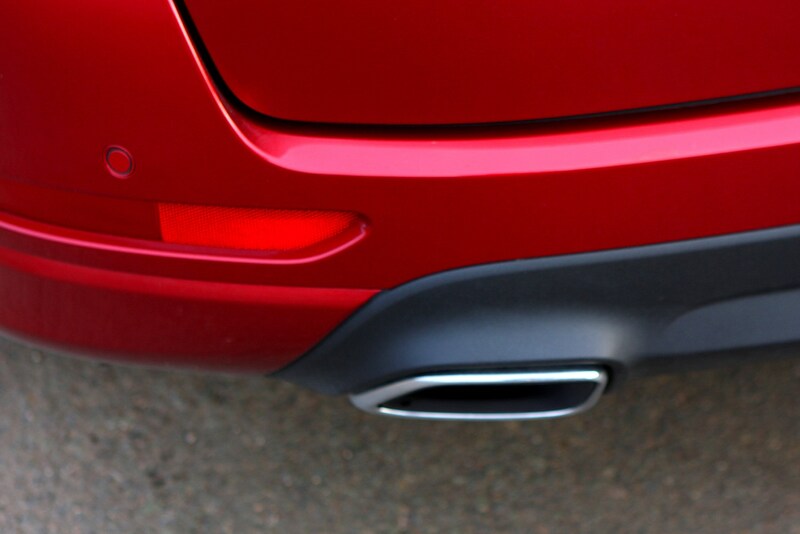 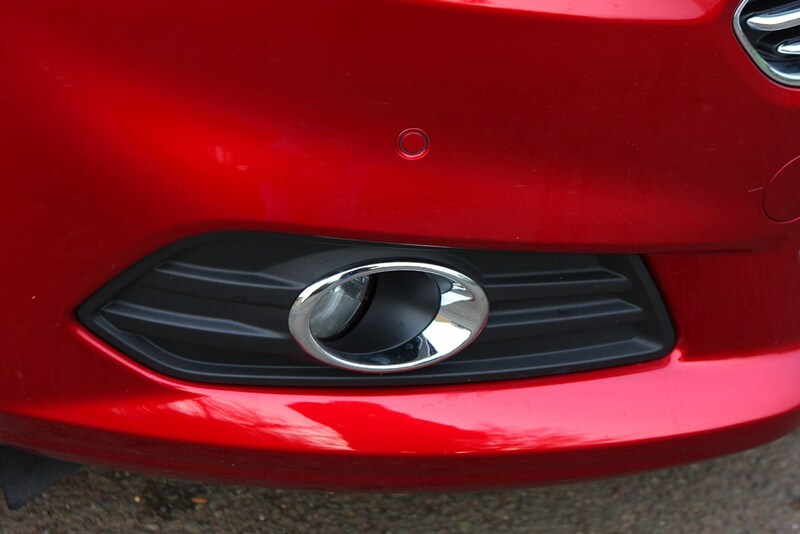 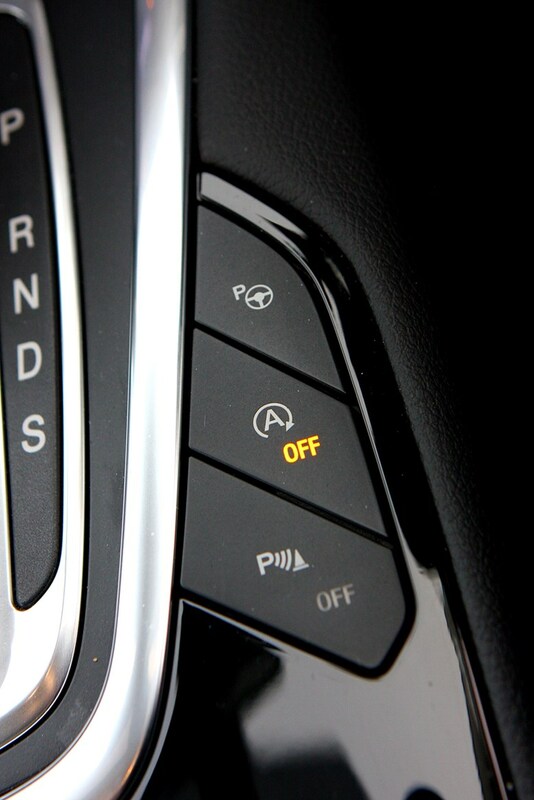 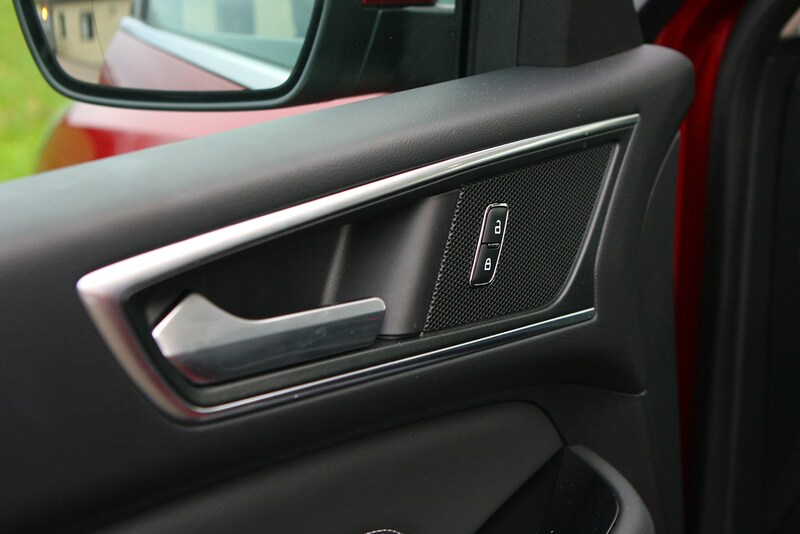 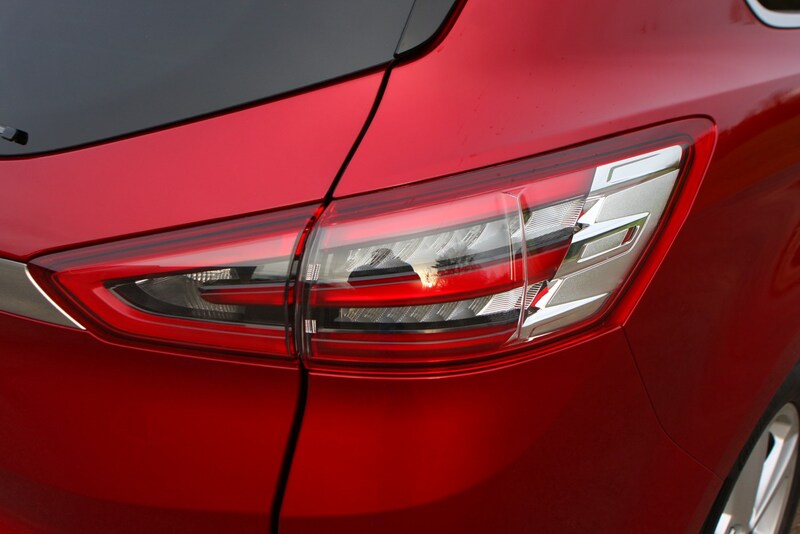 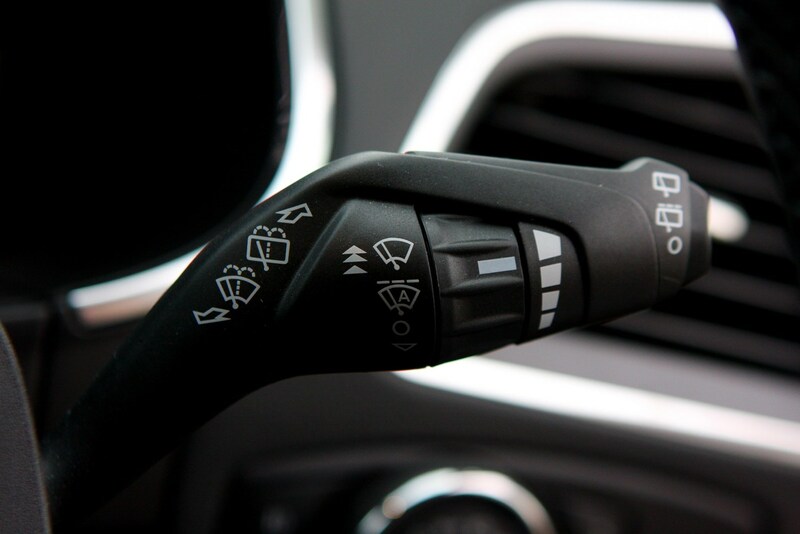 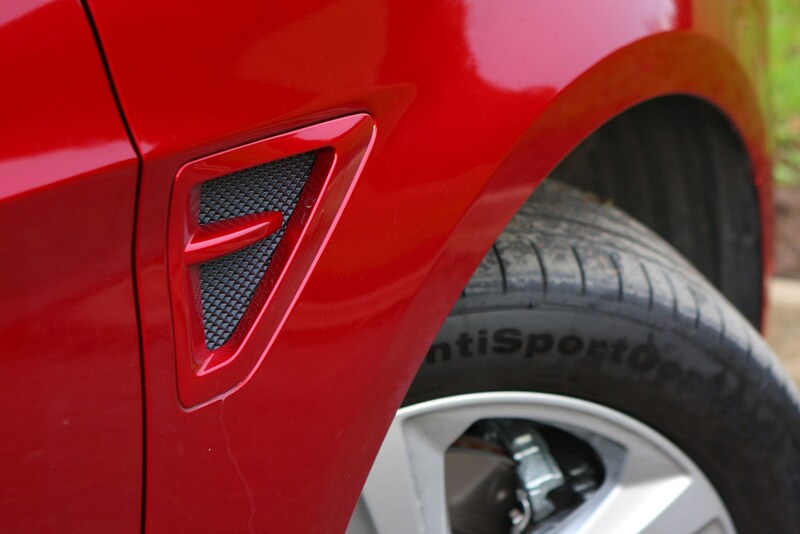 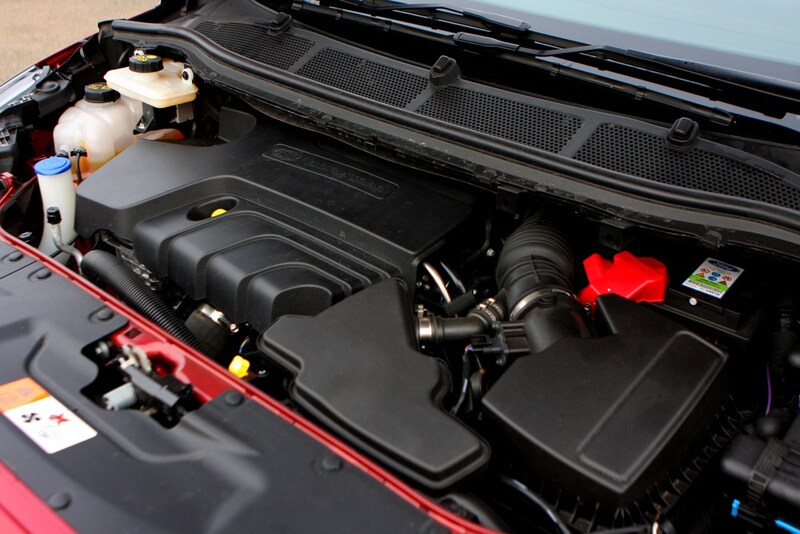 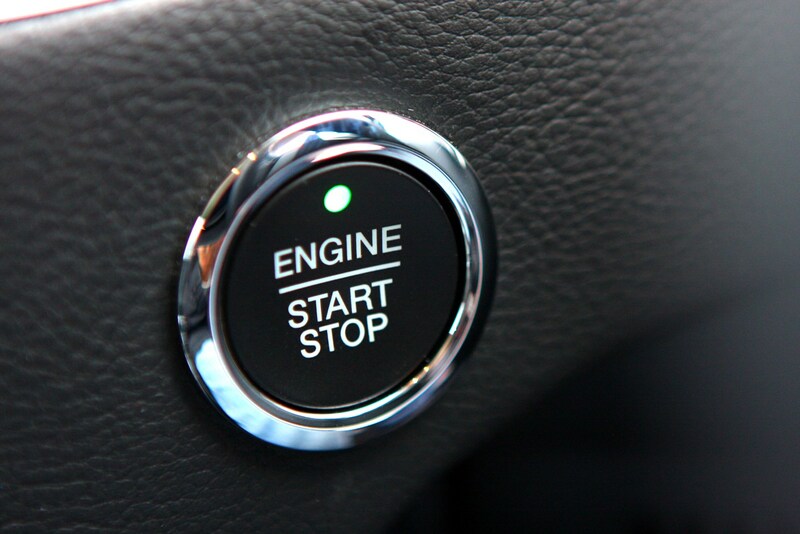 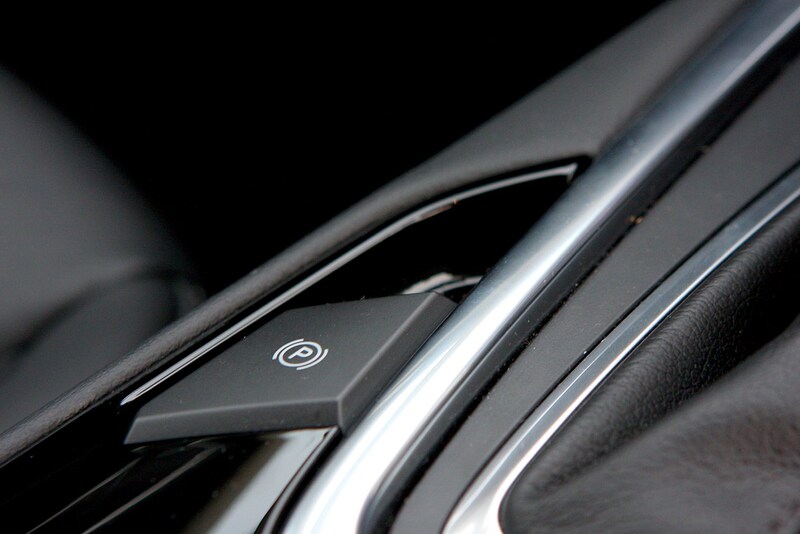 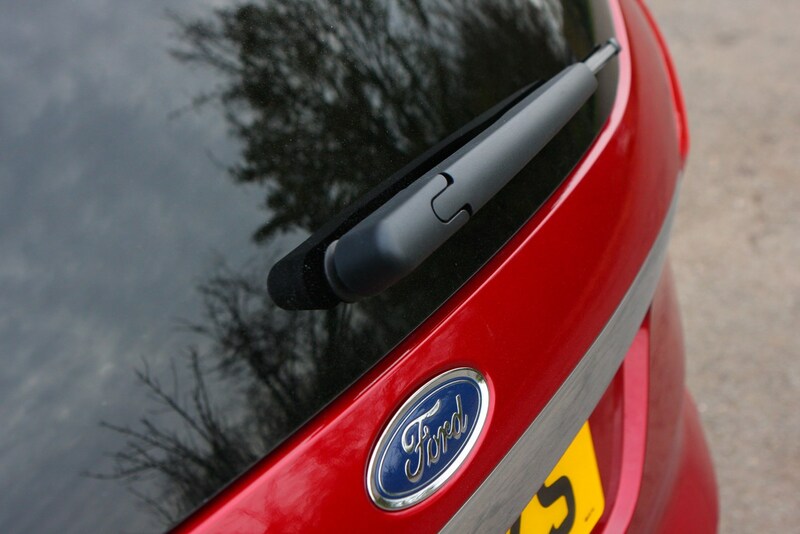 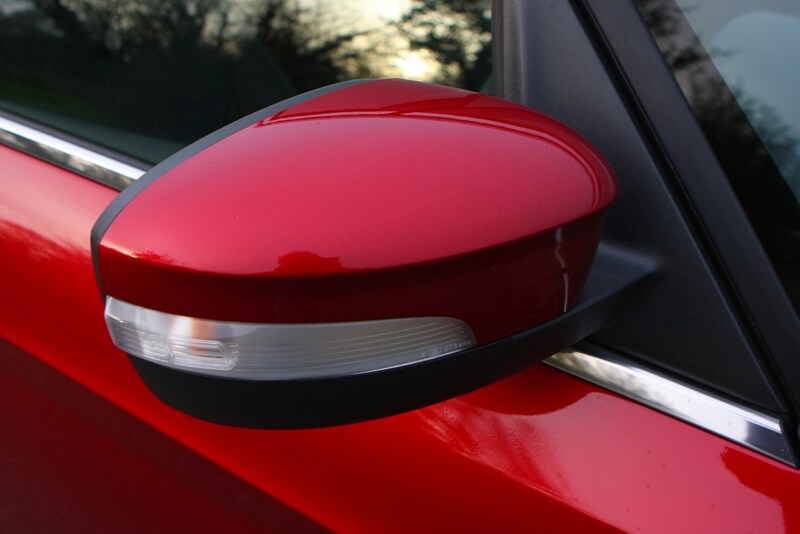 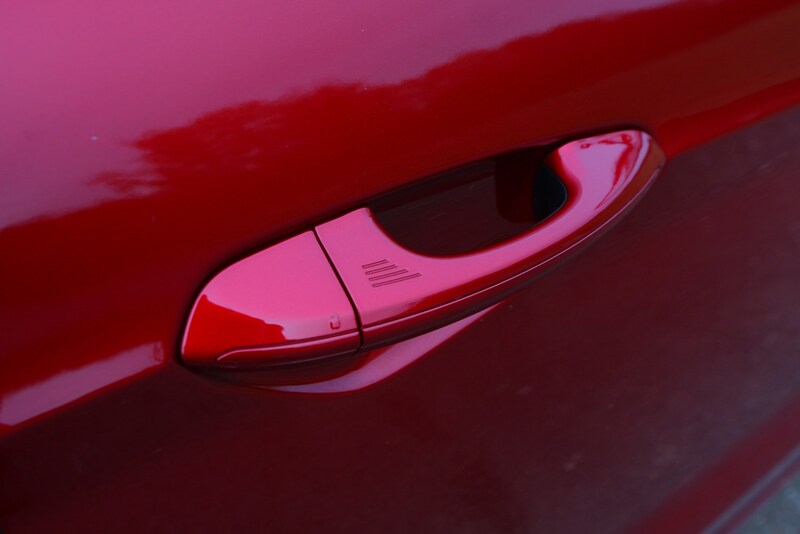 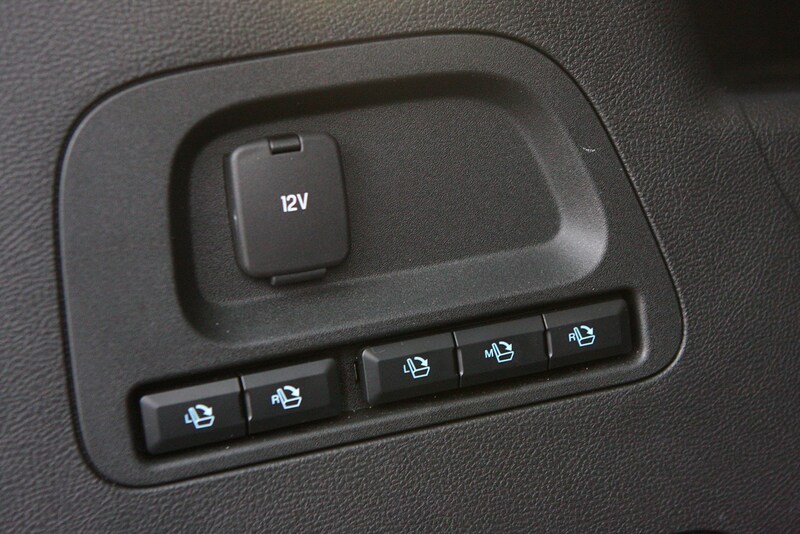 All cars have an active grille shutter to improve aerodynamics and therefore fuel efficiency. 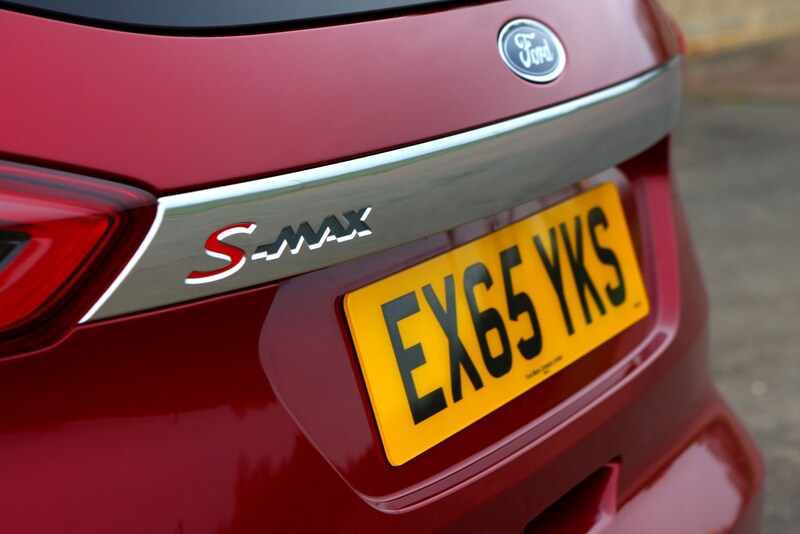 The S-Max has always been one of the best MPVs to drive, and the second-generation model is better than ever. 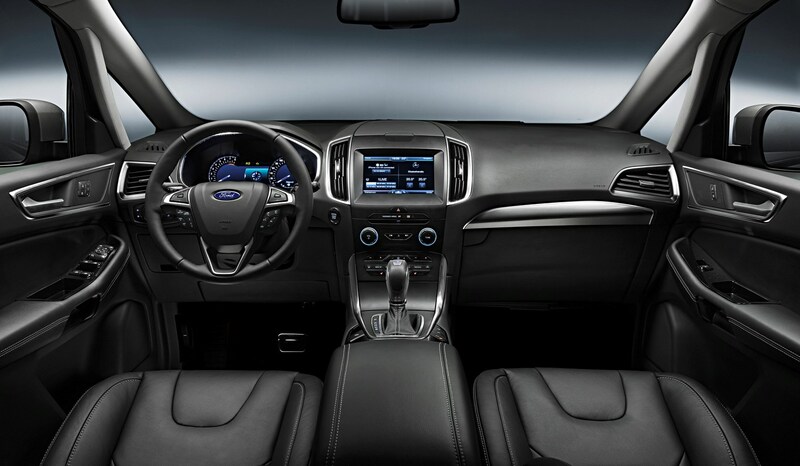 Sharp steering and taut body control, mixed with a supple ride comfort, mean this seven-seater Ford is as much fun for the driver as it is comfortable for passengers. 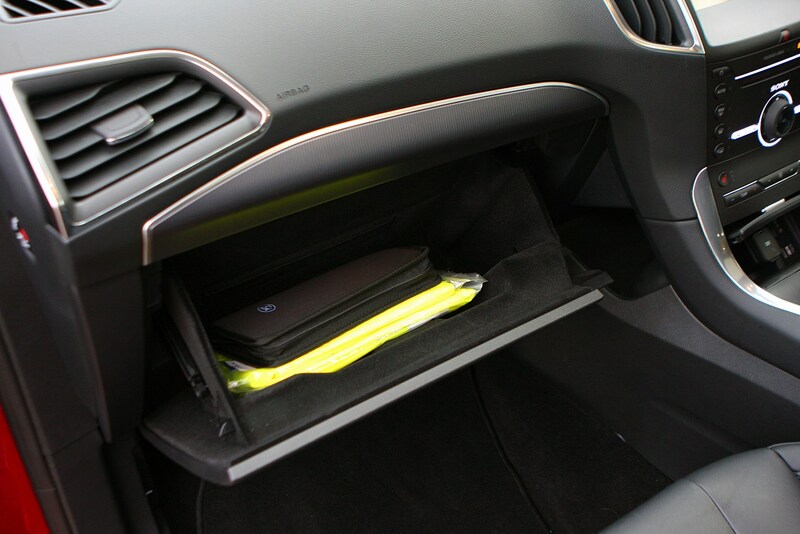 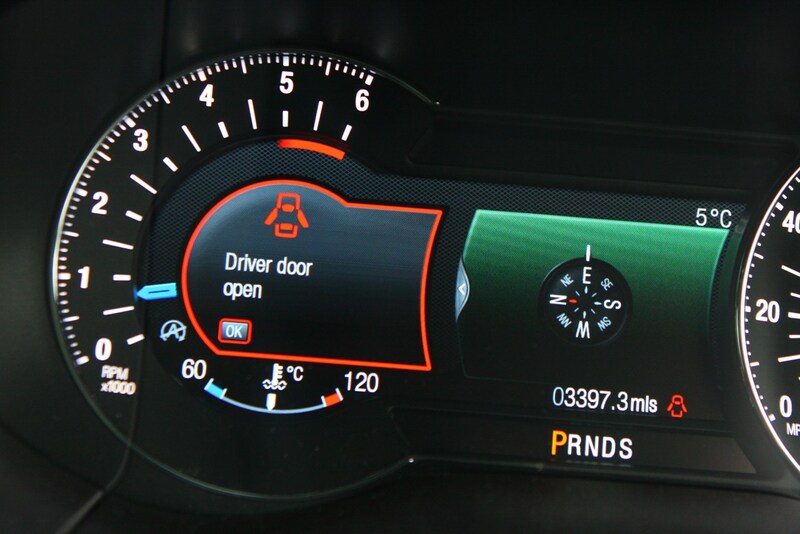 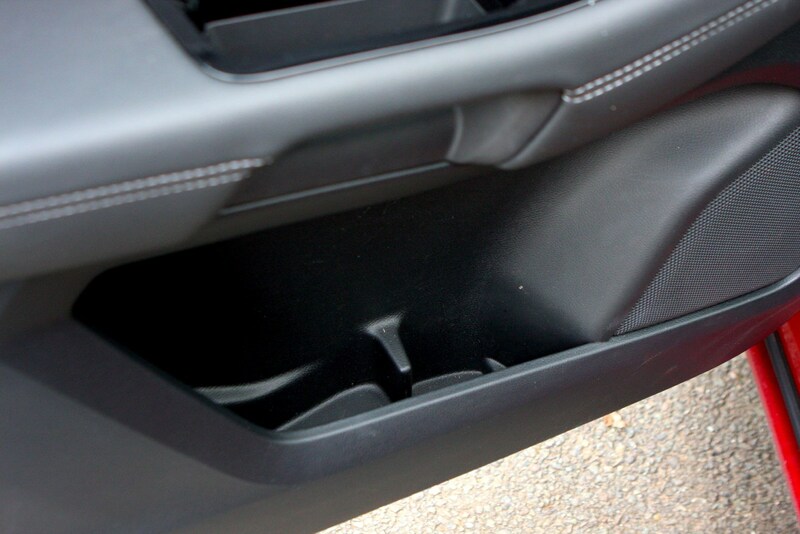 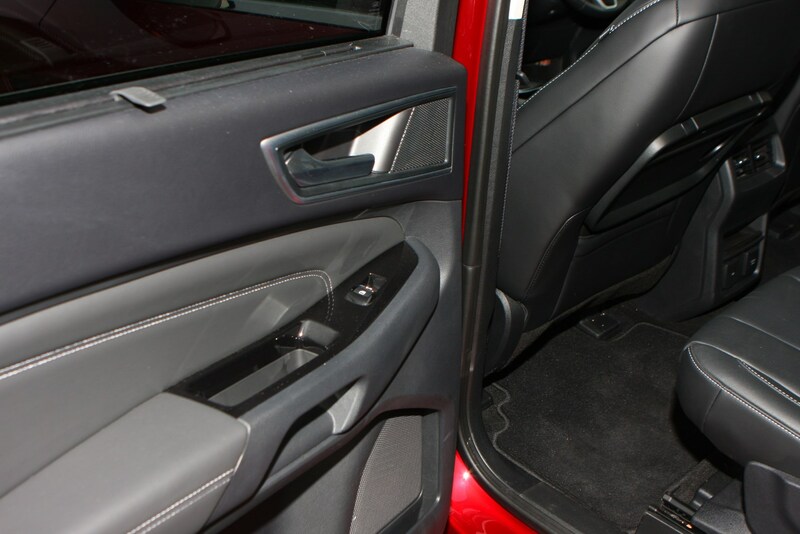 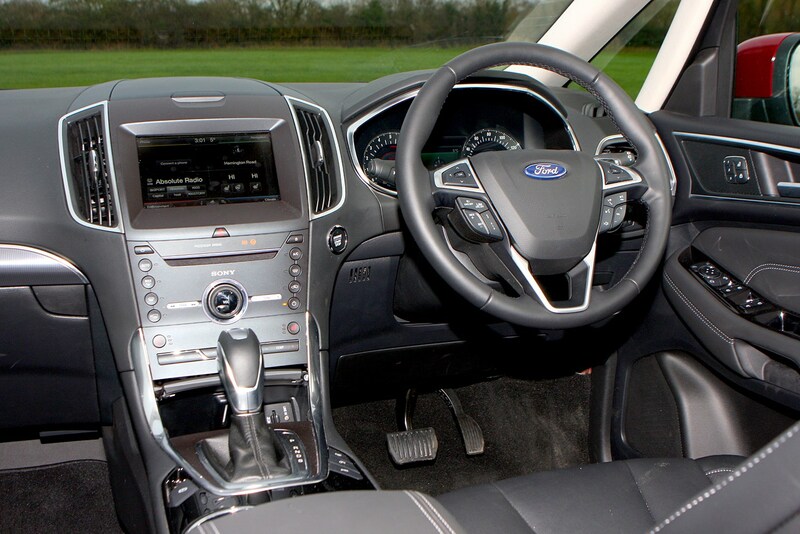 Sharing underpinnings with the Mondeo means the S-Max shares plenty of other bits too, and parts of the interior will be familiar if you’ve been inside the company car favourite. 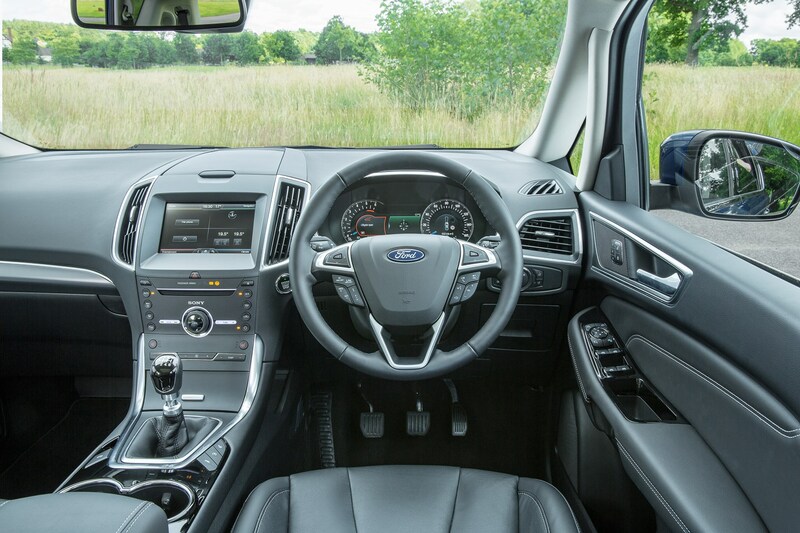 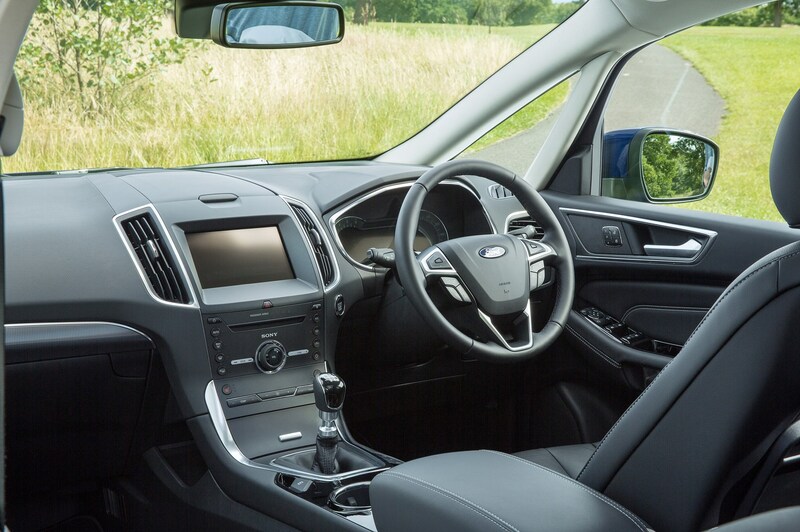 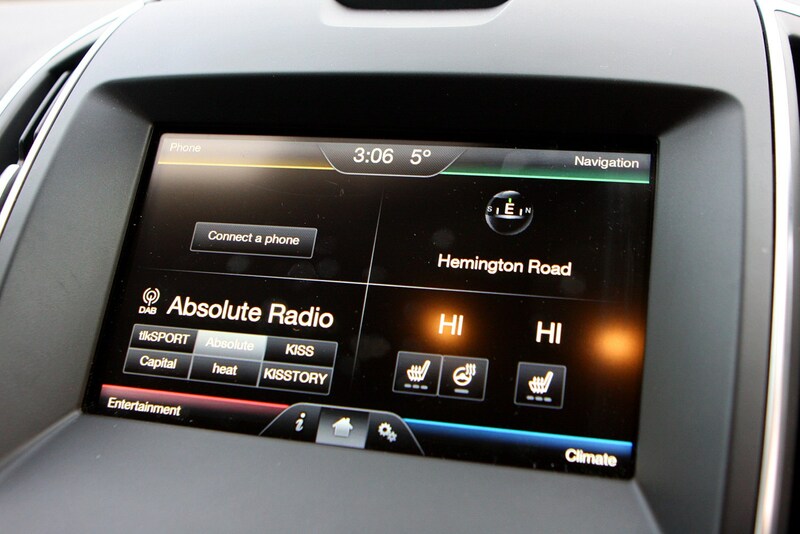 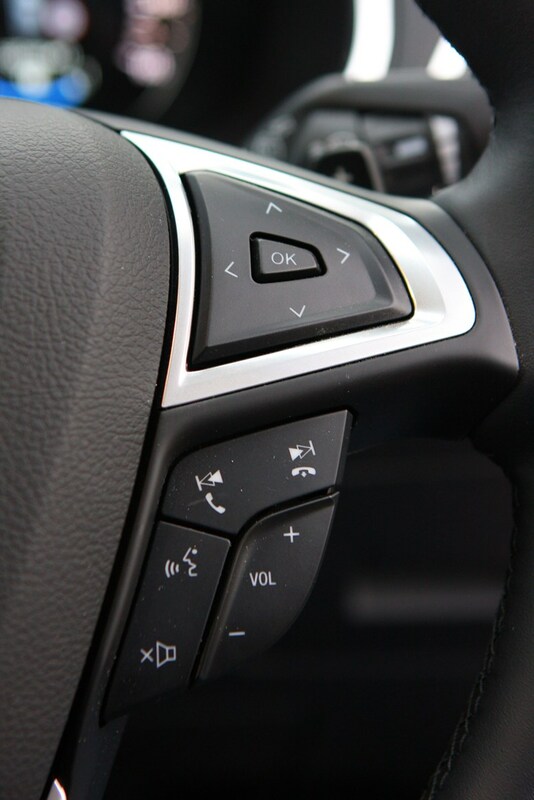 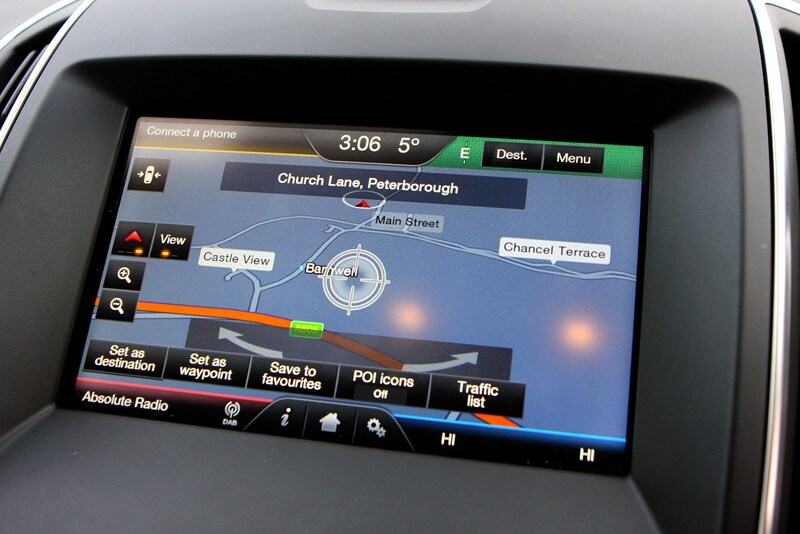 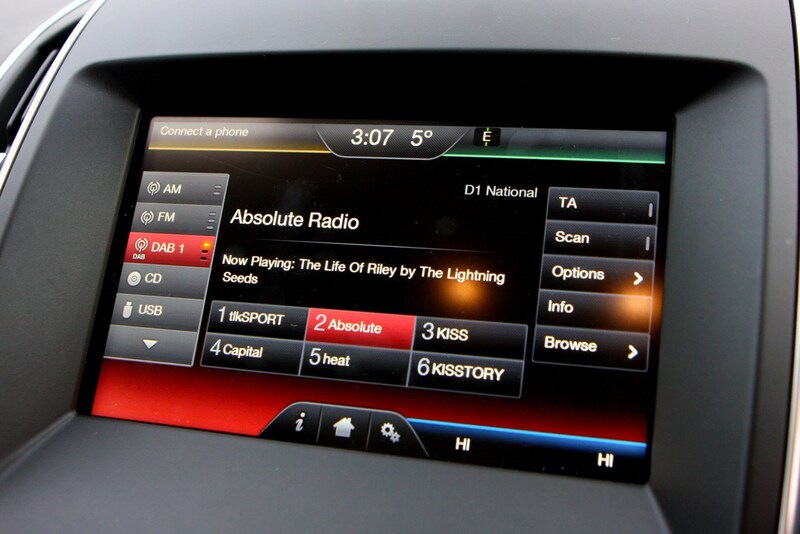 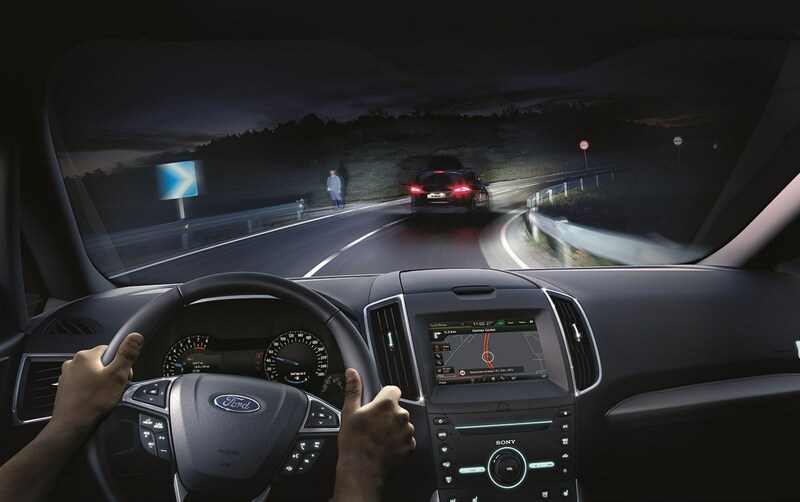 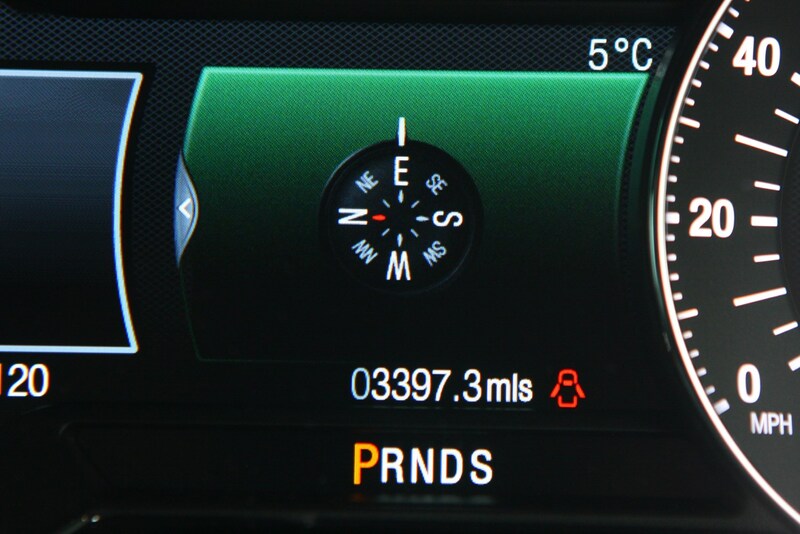 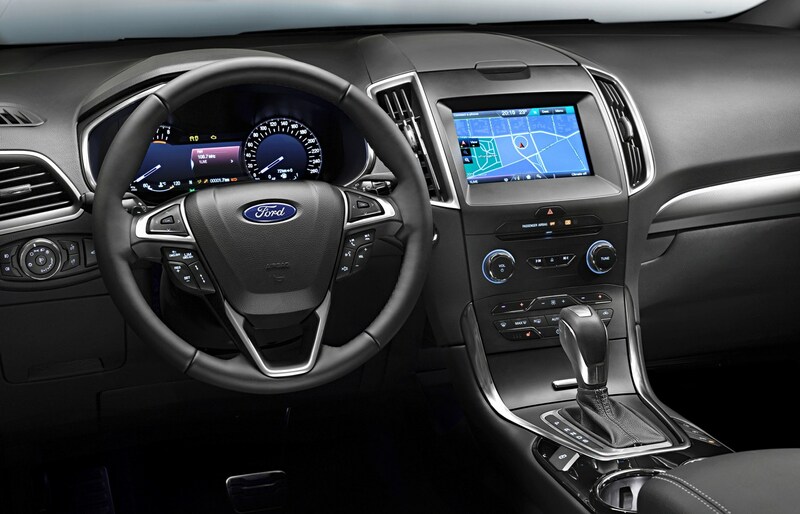 It’s a simple layout inside, but it’s all very easy to use, centring around a large touchscreen featuring Ford’s Sync3 multimedia system, some slick digital dials, a set of very comfortable seats and a solid feeling of refinement all-round. 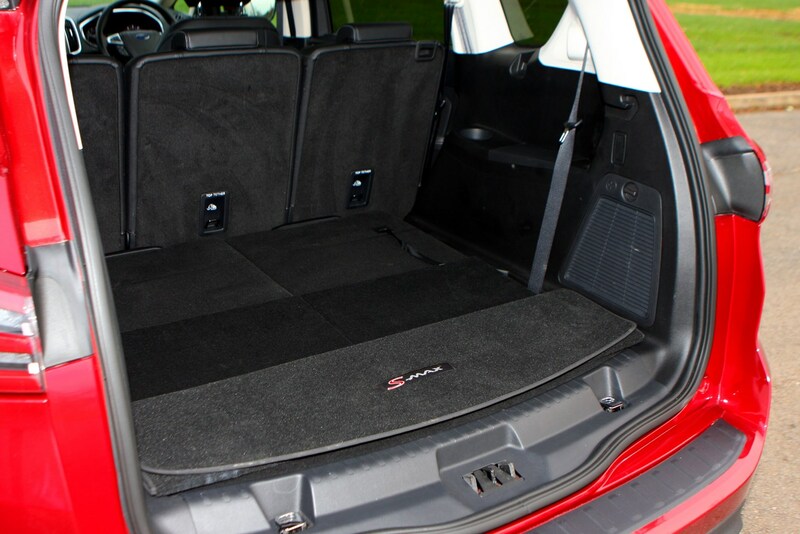 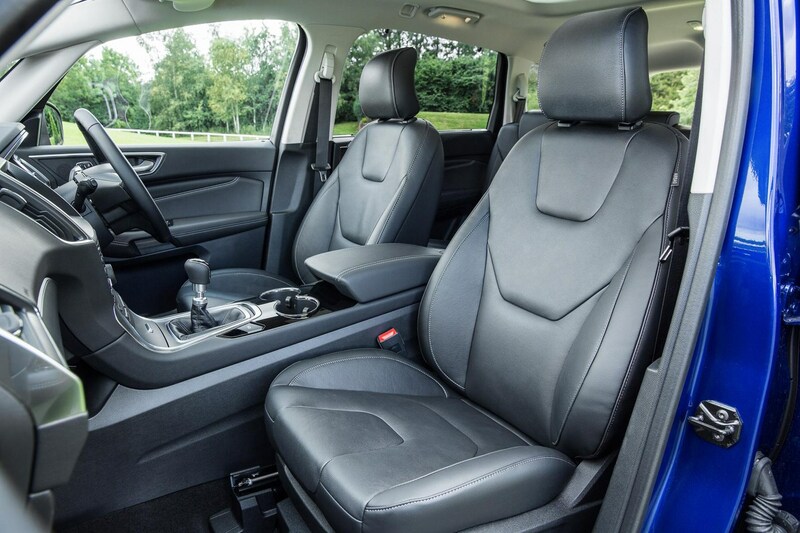 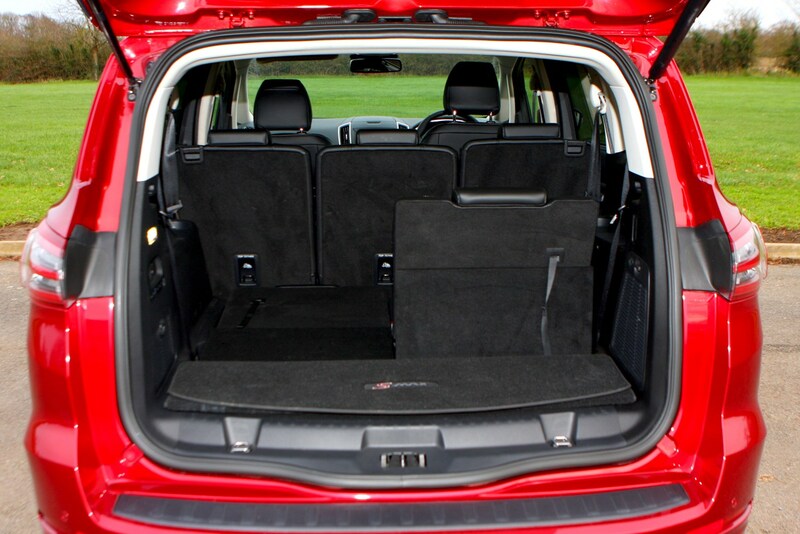 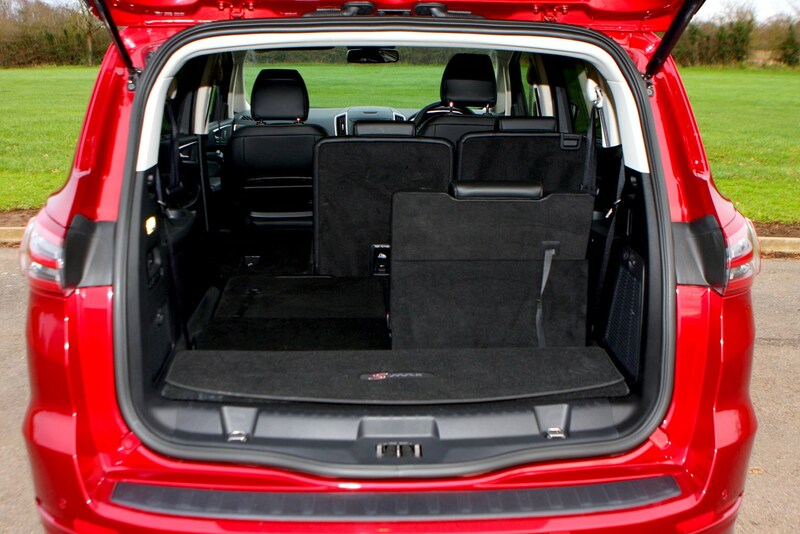 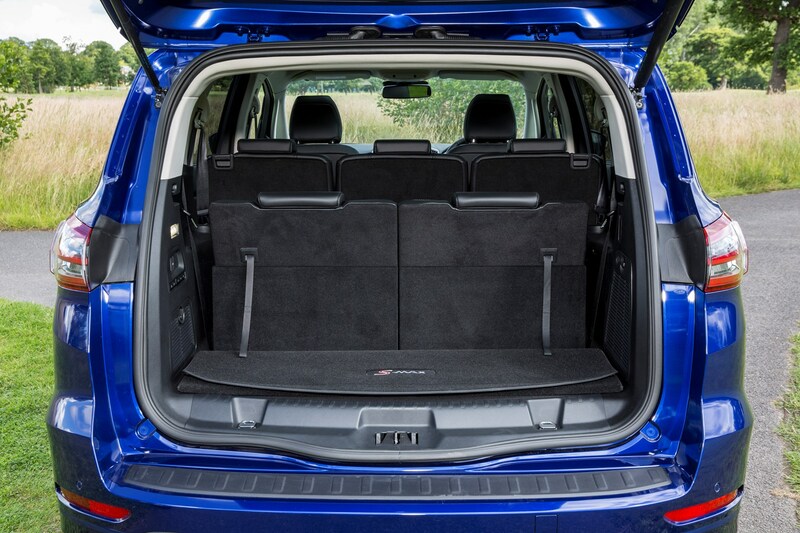 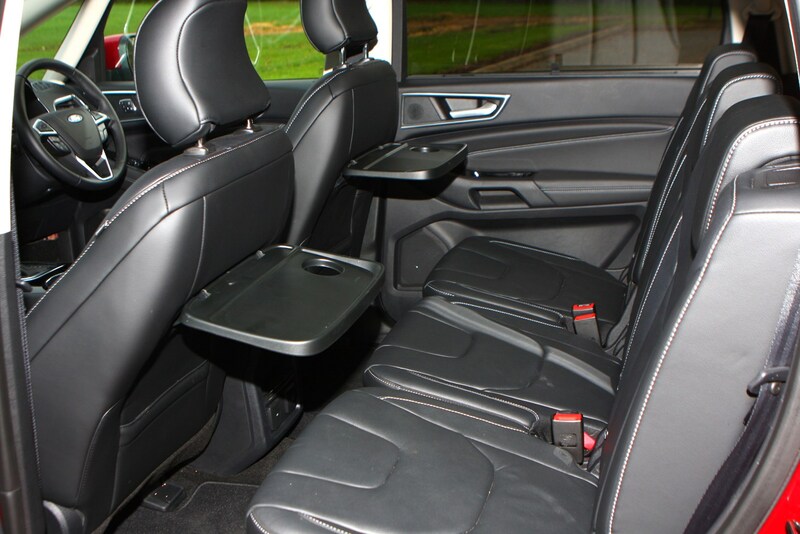 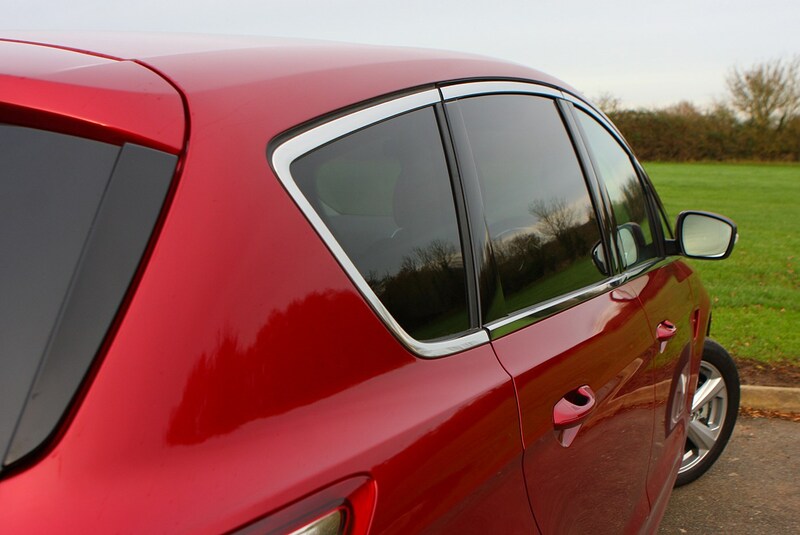 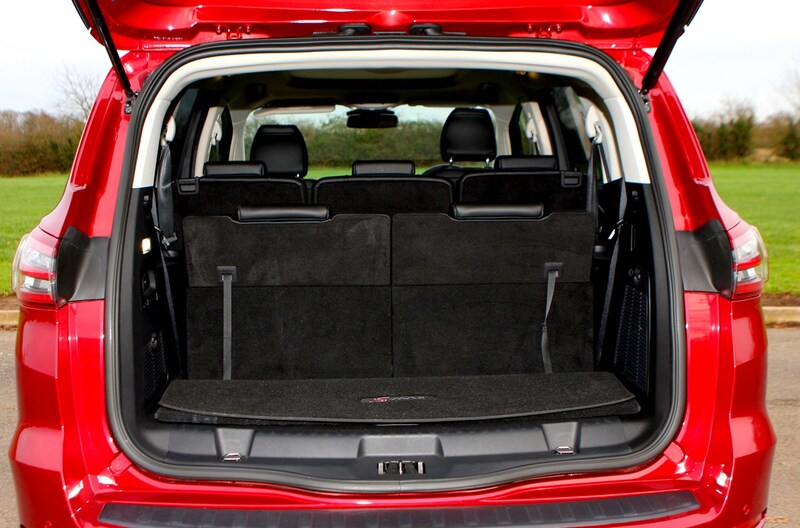 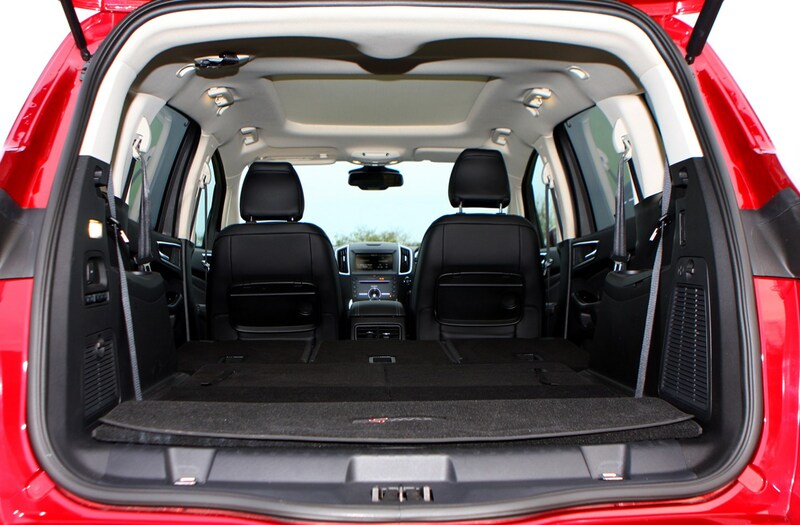 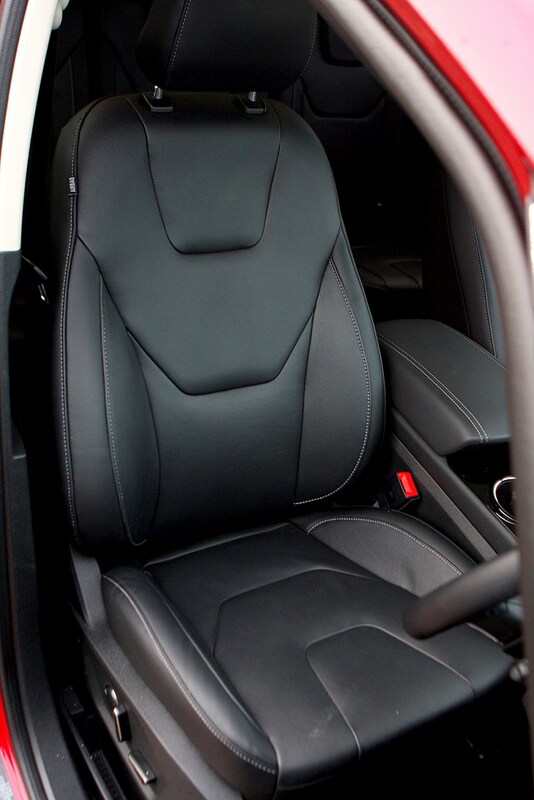 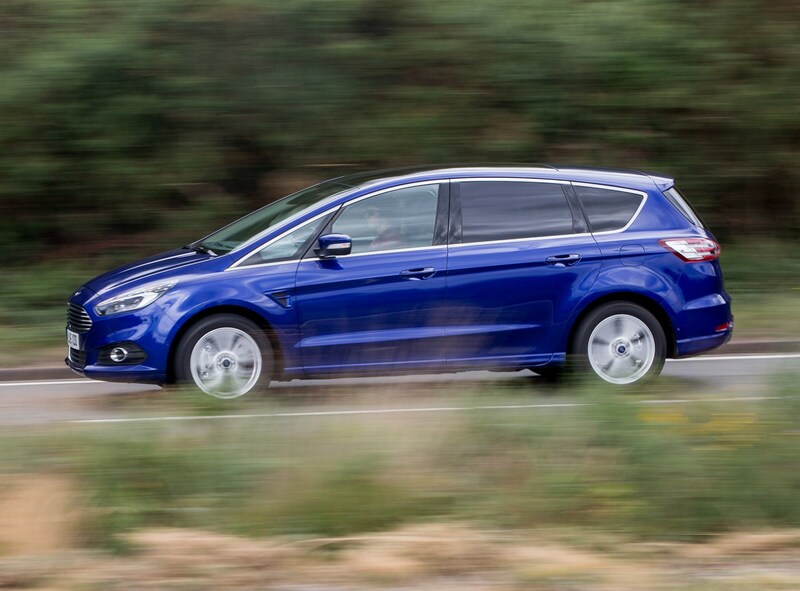 While there’s seating for seven, the rearmost seats are best left for small children as the S-Max’s sloping roofline eats into headroom at the back of the car. 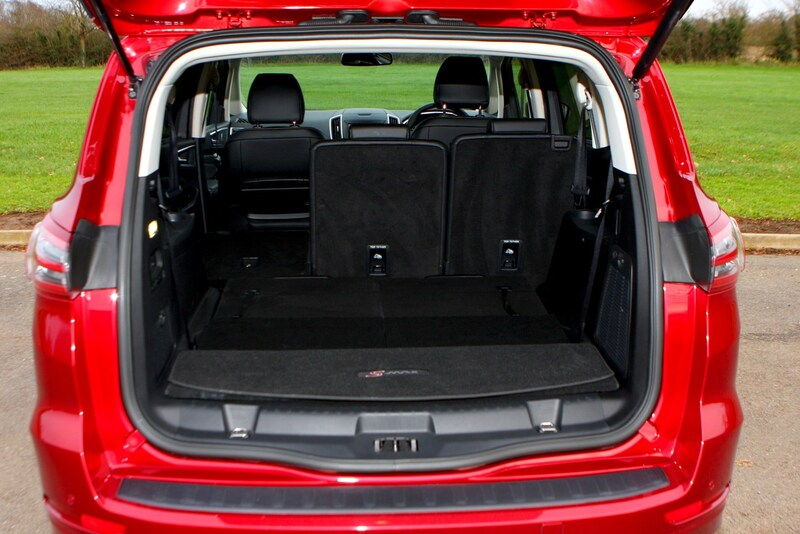 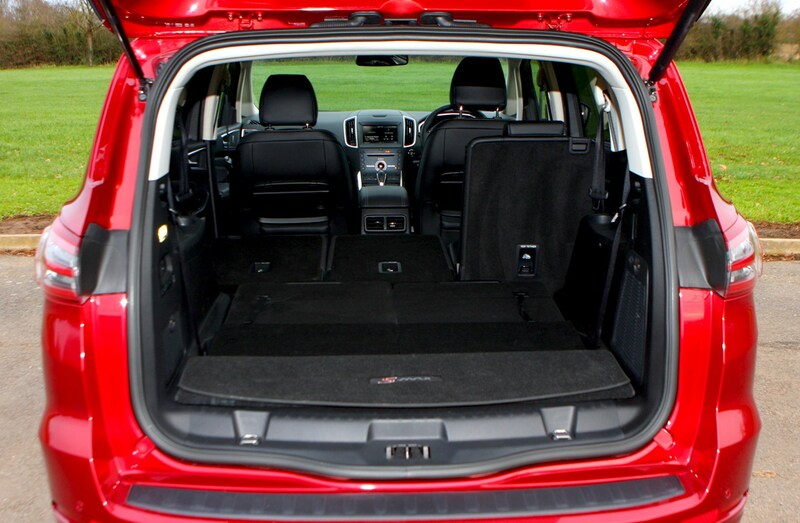 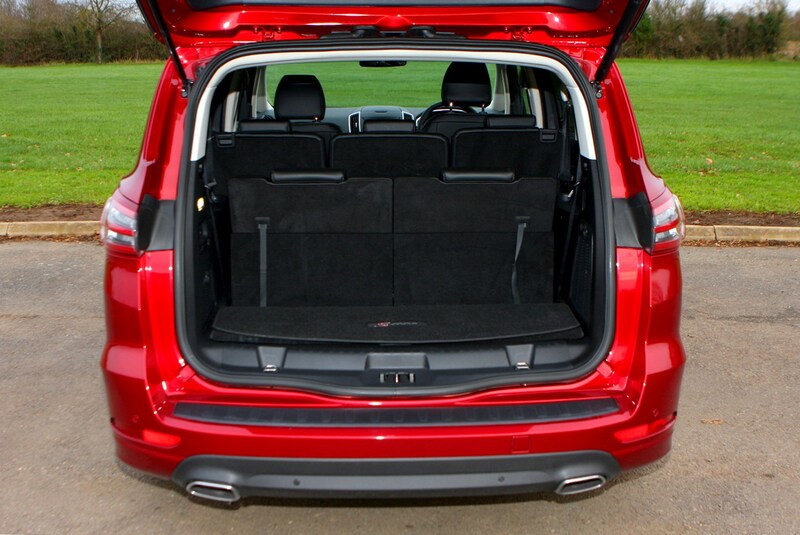 There’s a good amount of flexibility though, as all the seats are individual, with the middle row all sliding back and forth individually, while all five rear seats fold flat into the floor to turn the S-Max into a makeshift van. 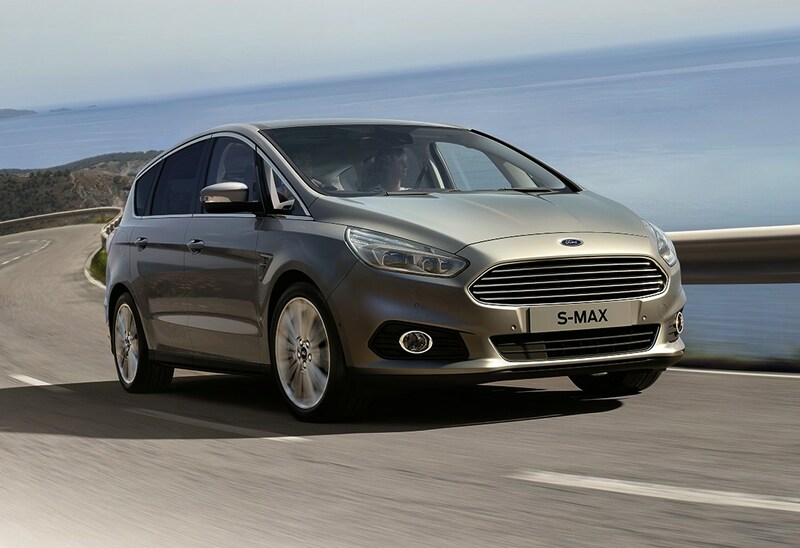 Unsurprisingly, it’s the diesel versions of the S-Max that make up the majority of sales in the UK. 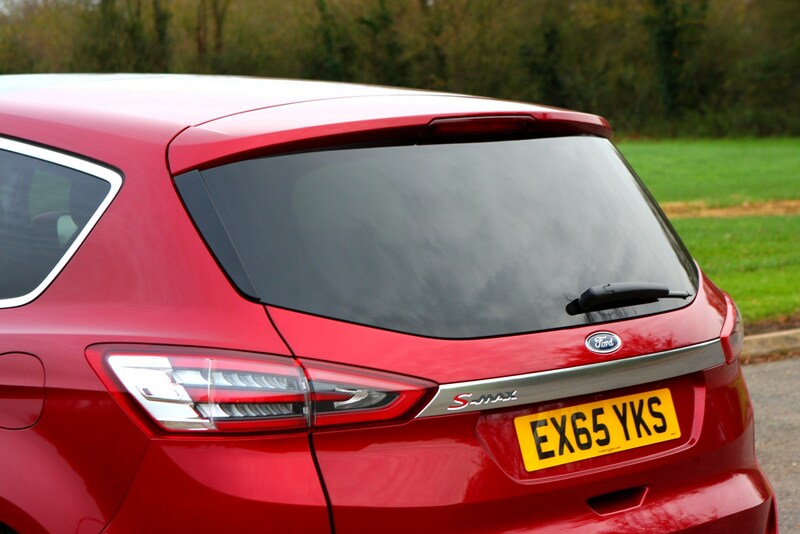 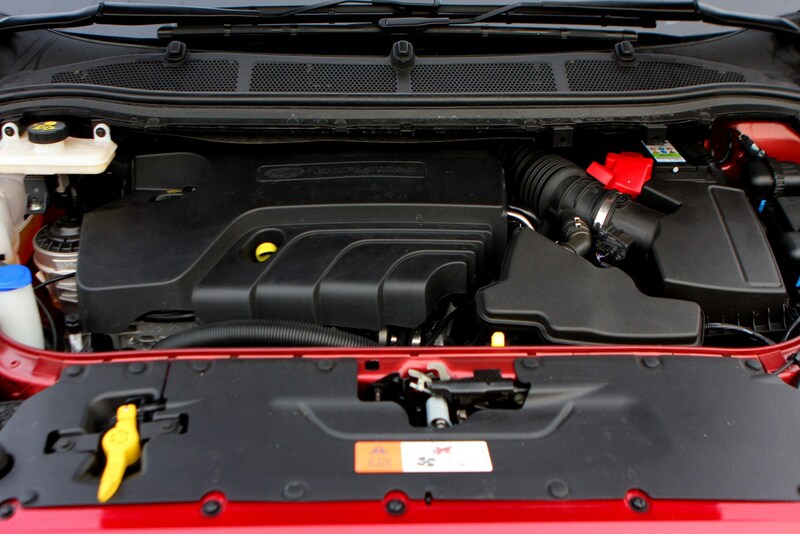 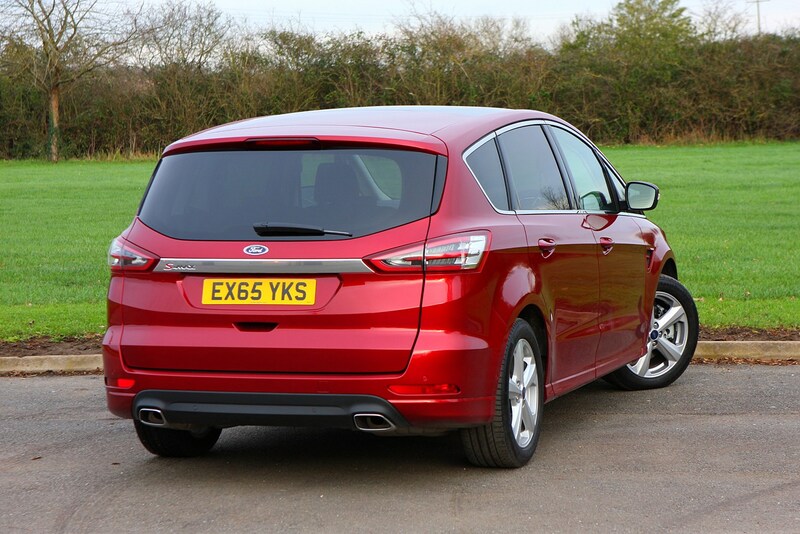 As such, Ford offers four to choose from, all 2.0 litres in size and ranging in power outputs from 120hp to 210hp. 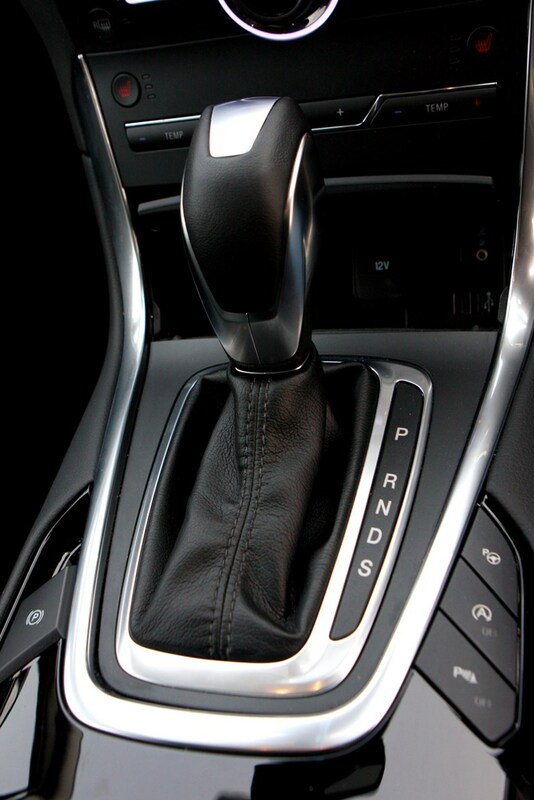 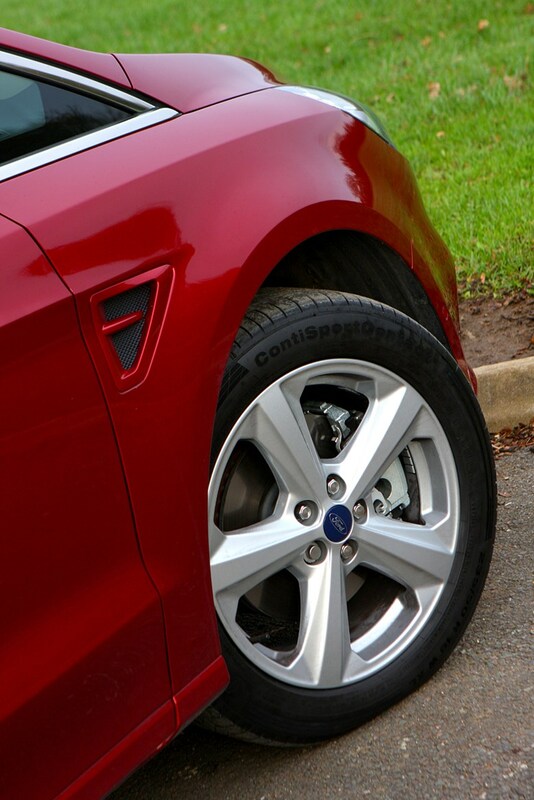 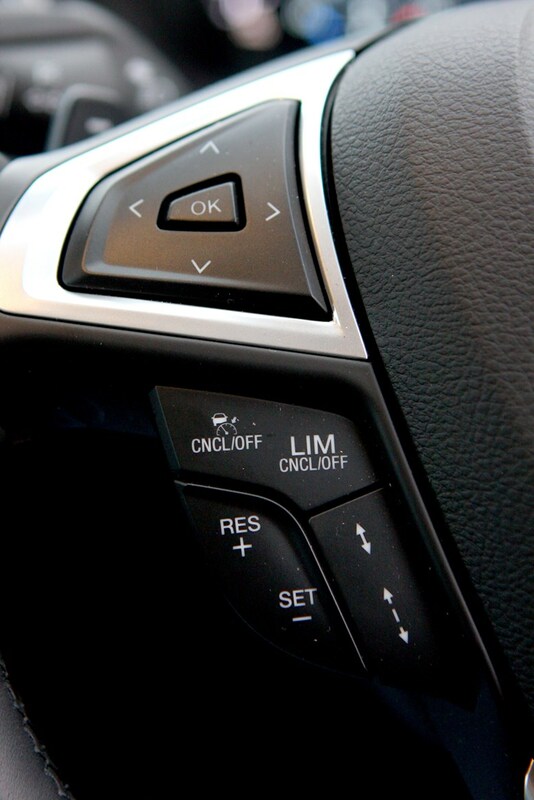 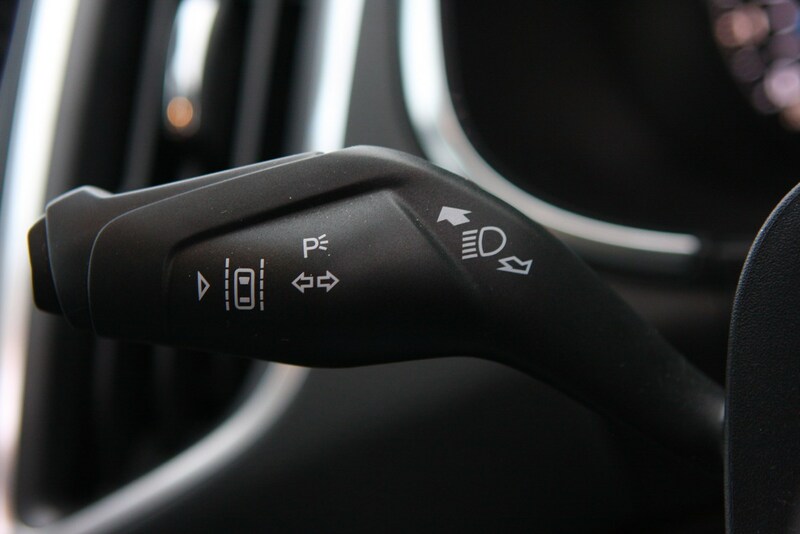 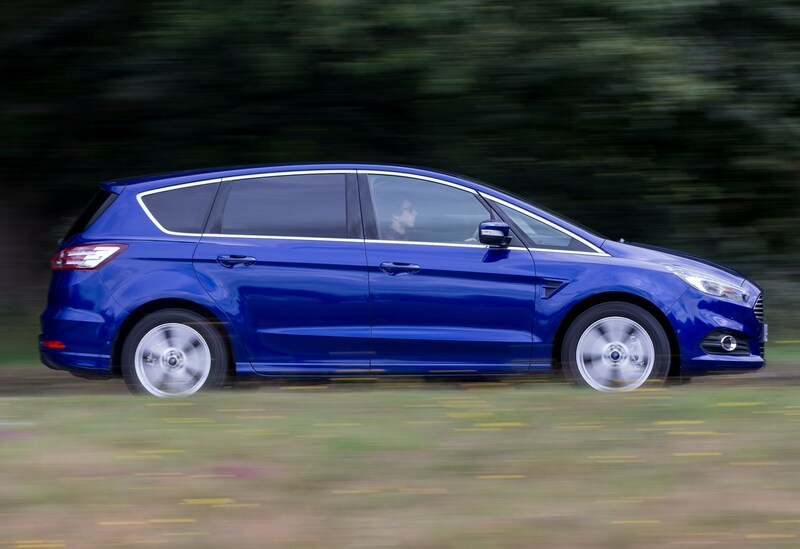 Ford’s PowerShift automatic gearboxes are available on the all but the entry-level diesel, while those after the stability of all-wheel drive will find this available on the two higher-output diesels – the 180 and 210hp versions. 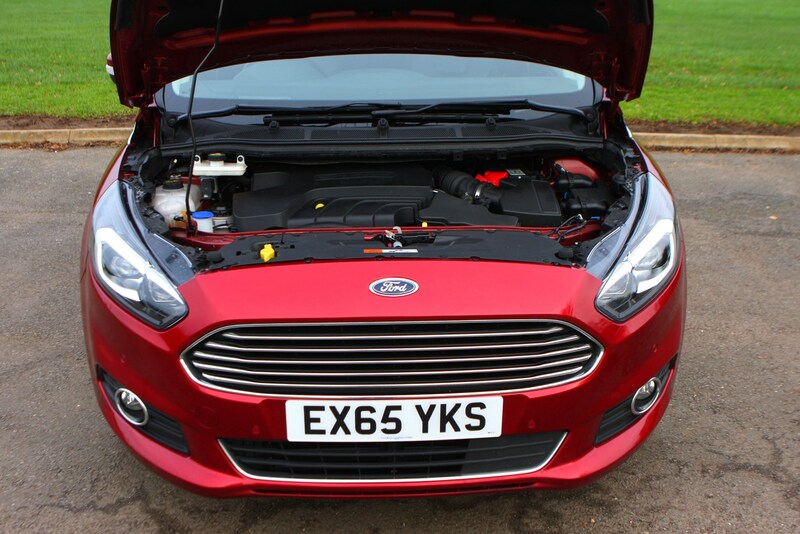 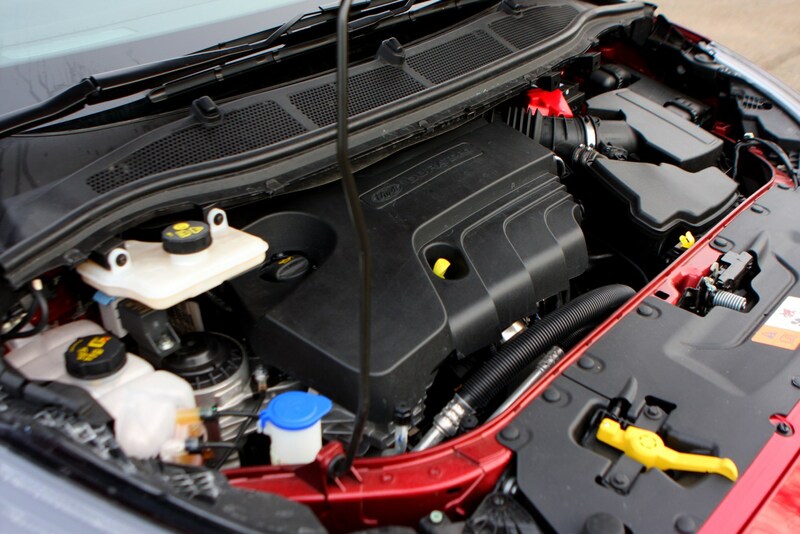 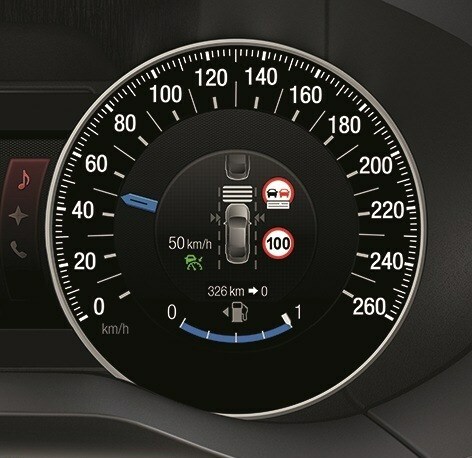 Those who prefer petrol power are catered for by a 1.5-litre turbocharged EcoBoost with 160hp or a 2.0-litre EcoBoost with 240hp, but these two will both struggle to match the diesels’ impressive fuel economy claims, more of which you can read about in the Running Costs section. 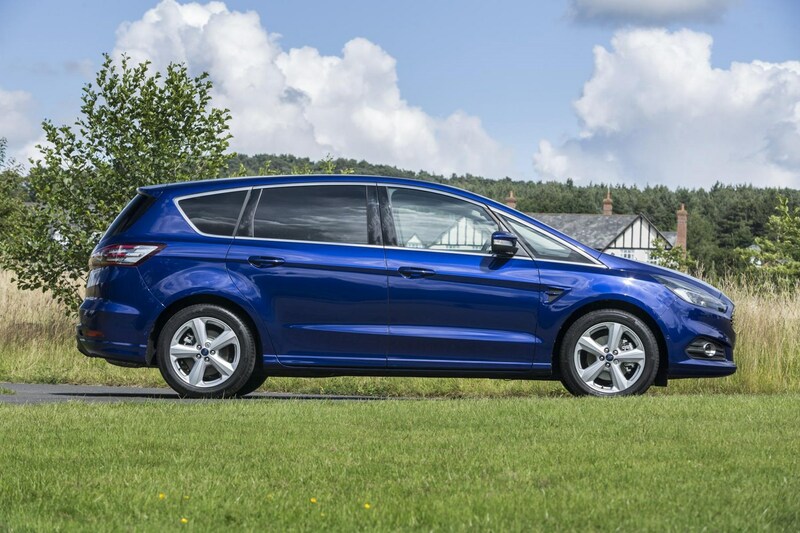 It doesn’t matter which version of the S-Max you get if you want a generous kit list, as Ford has lavished plenty of equipment on this seven-seater. 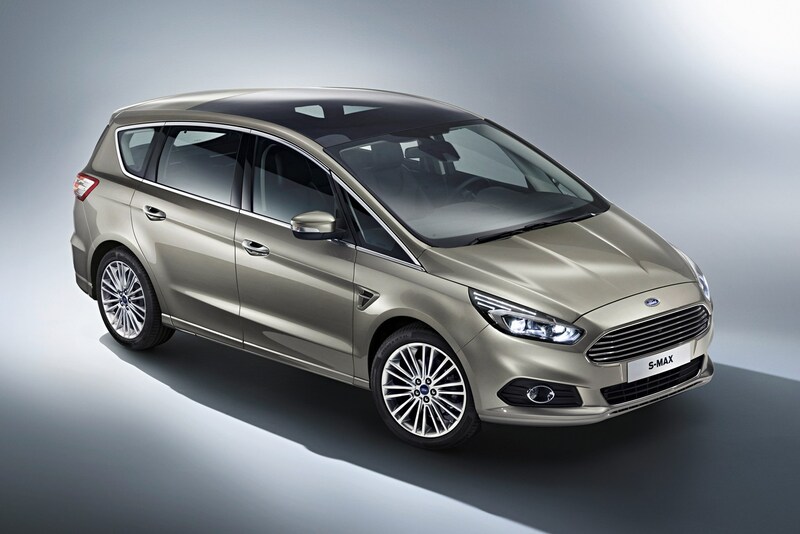 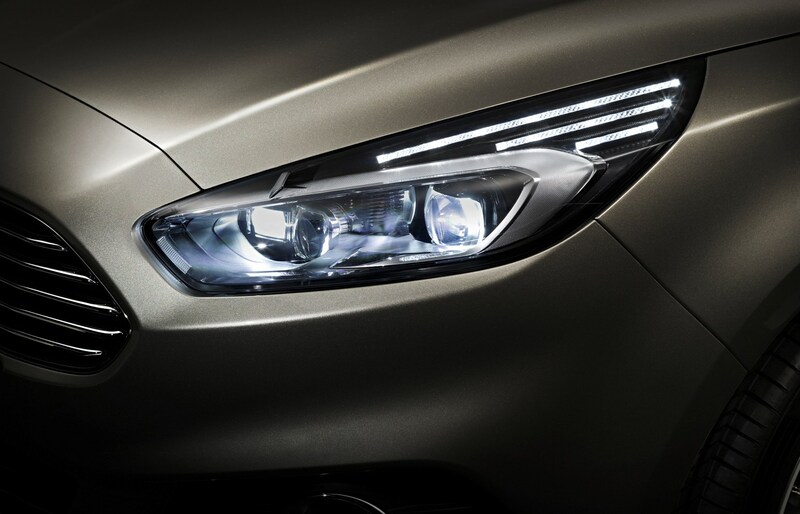 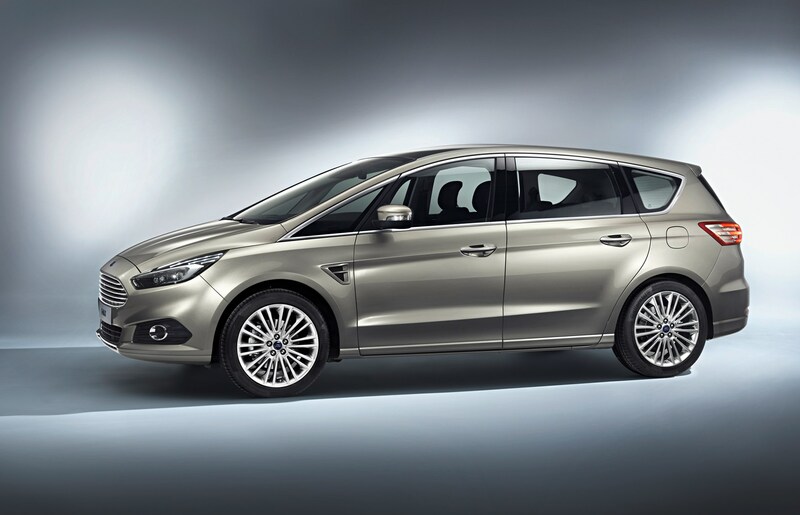 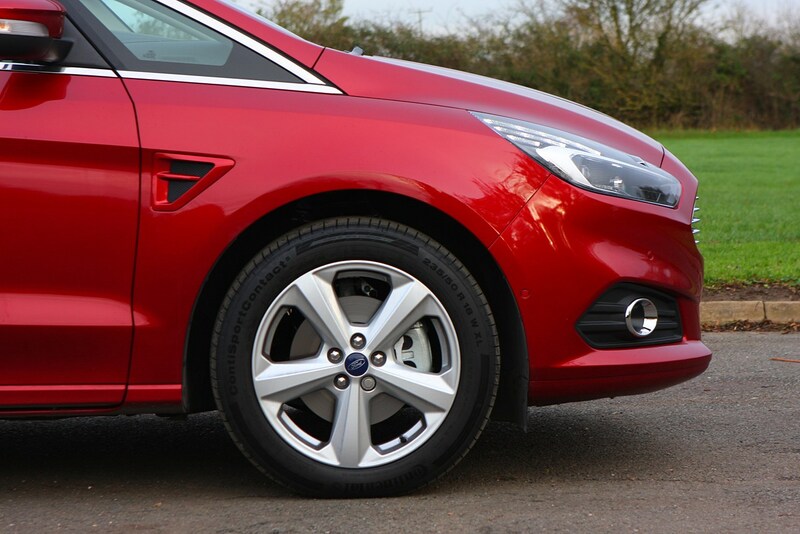 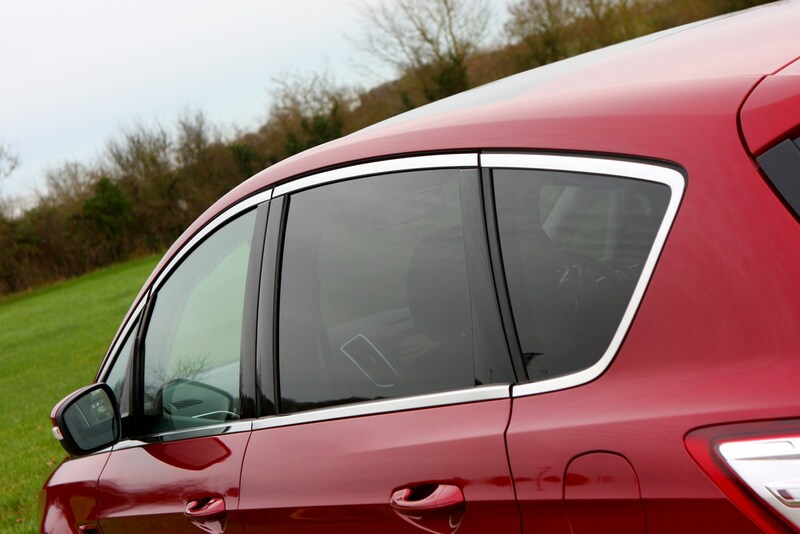 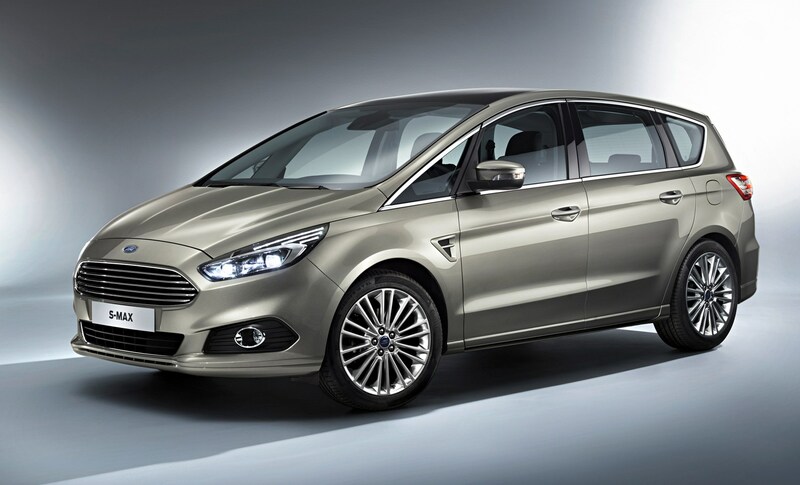 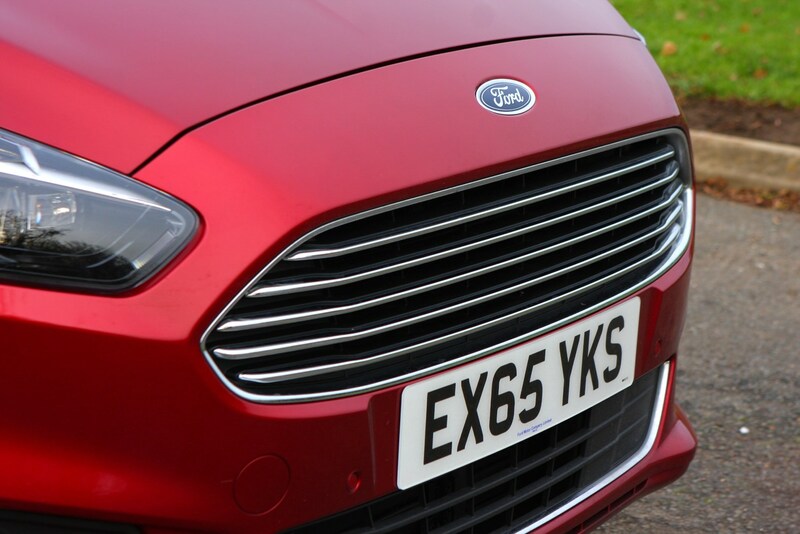 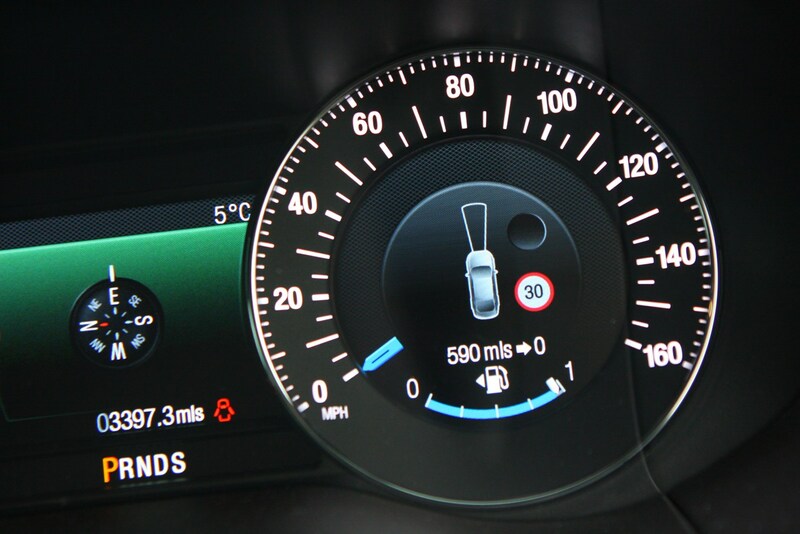 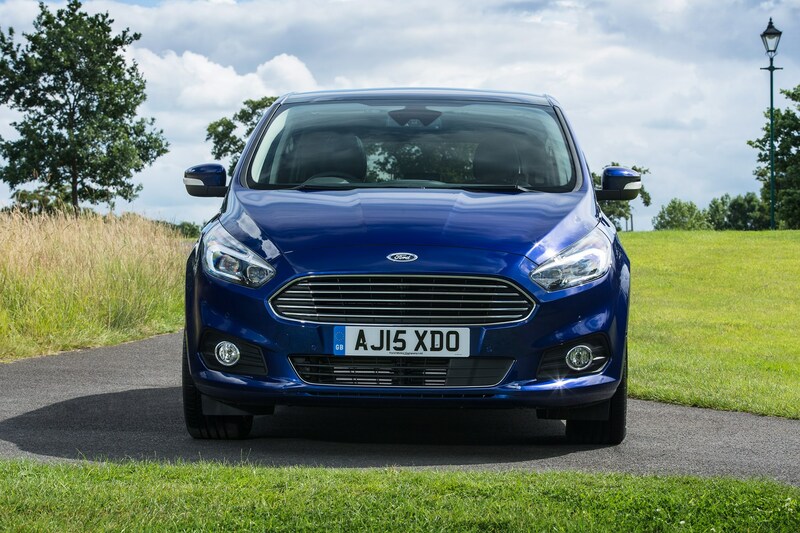 The model range is a familiar one, made up of Zetec, Titanium, ST-Line and luxurious Vignale. 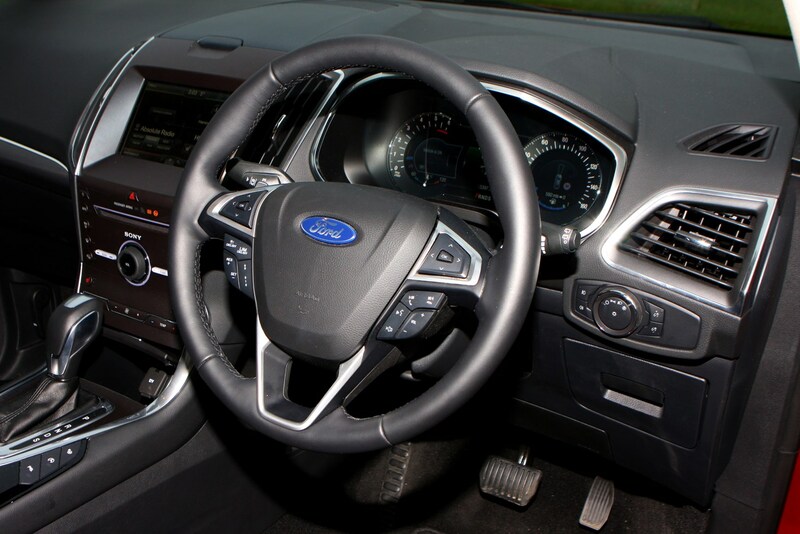 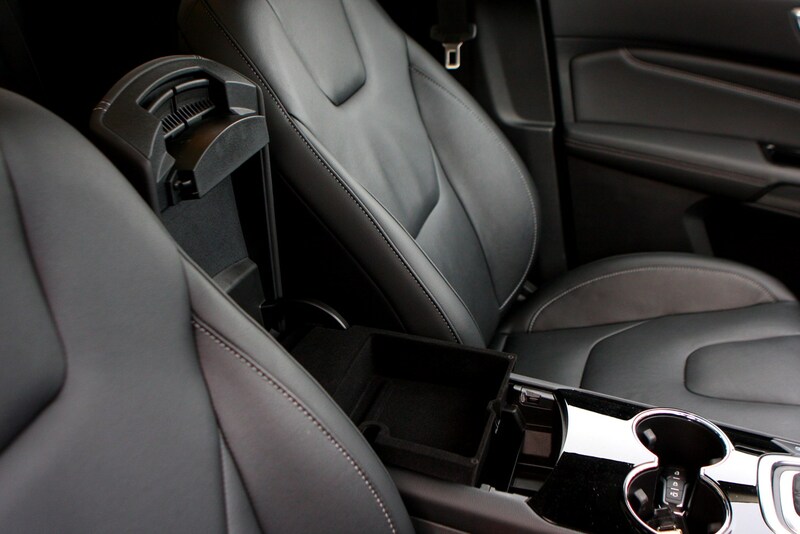 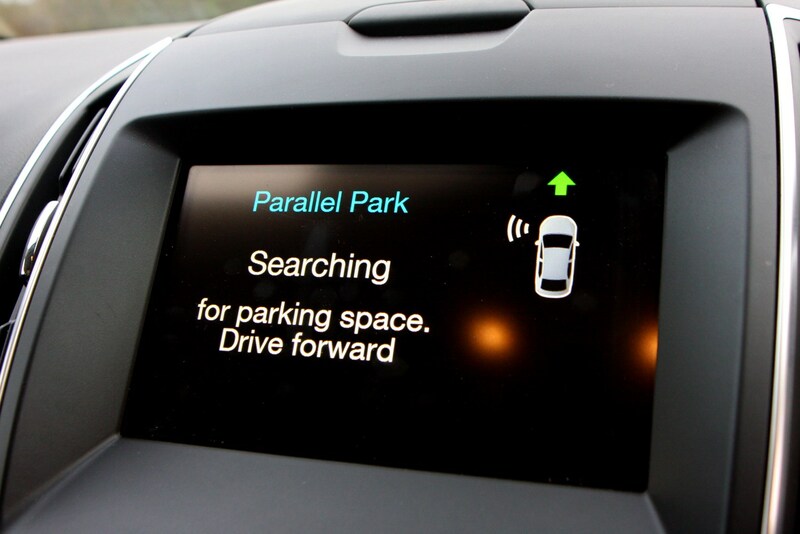 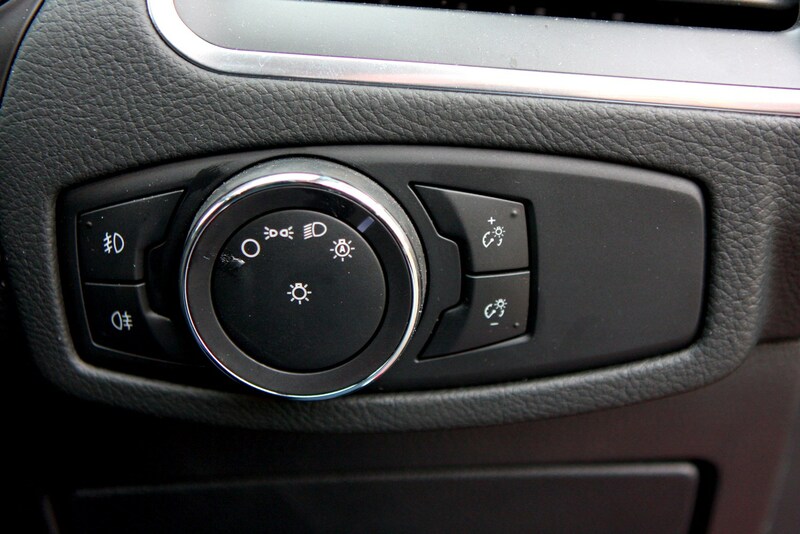 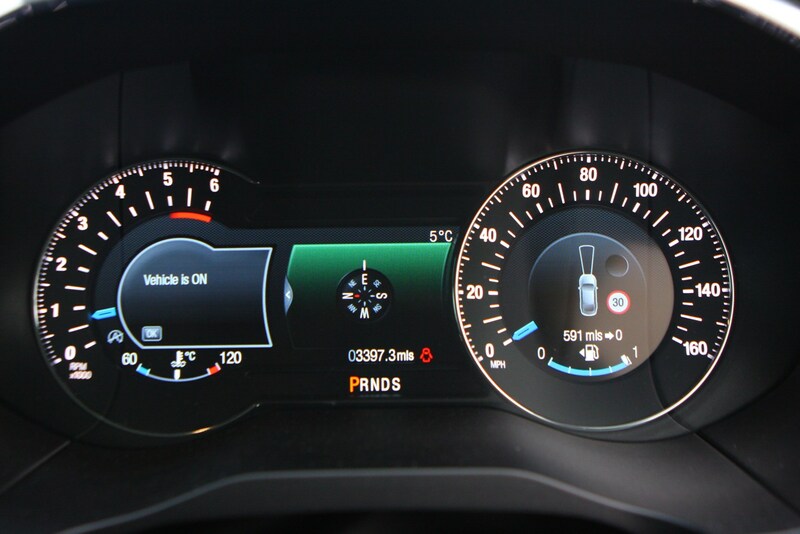 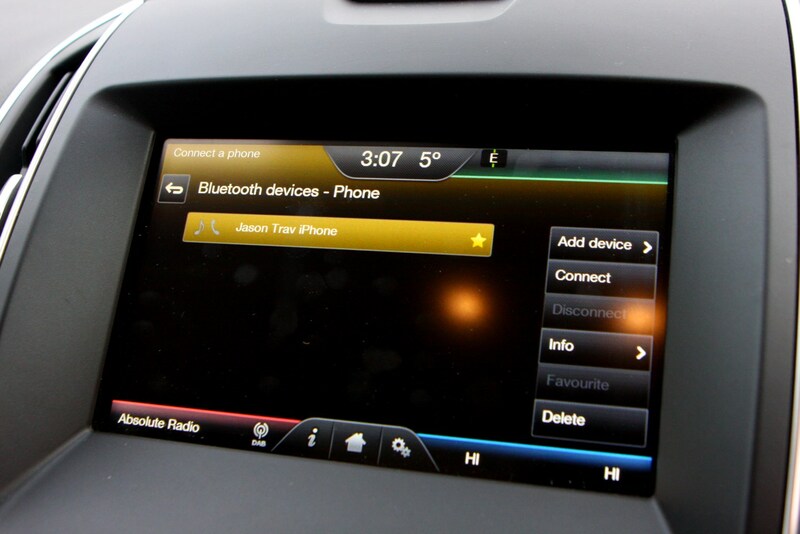 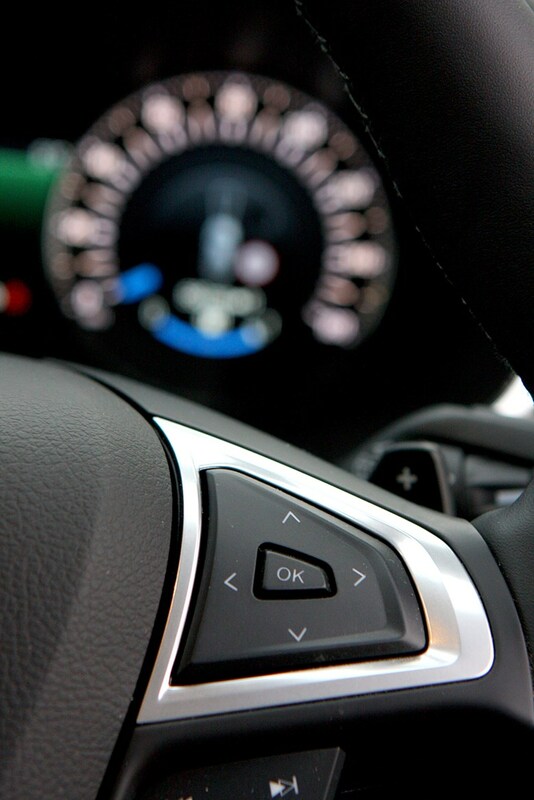 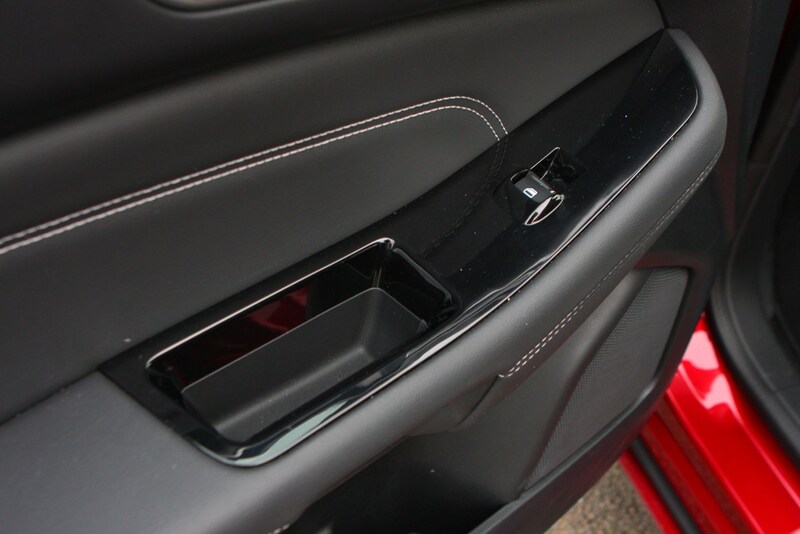 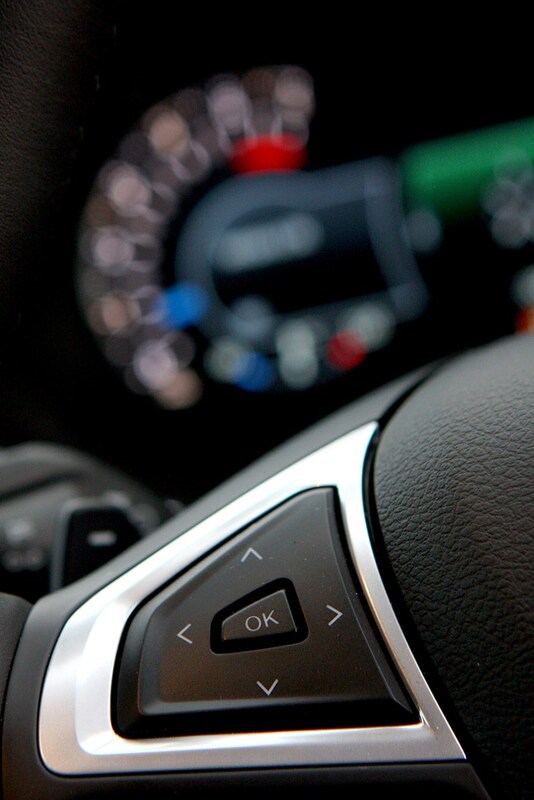 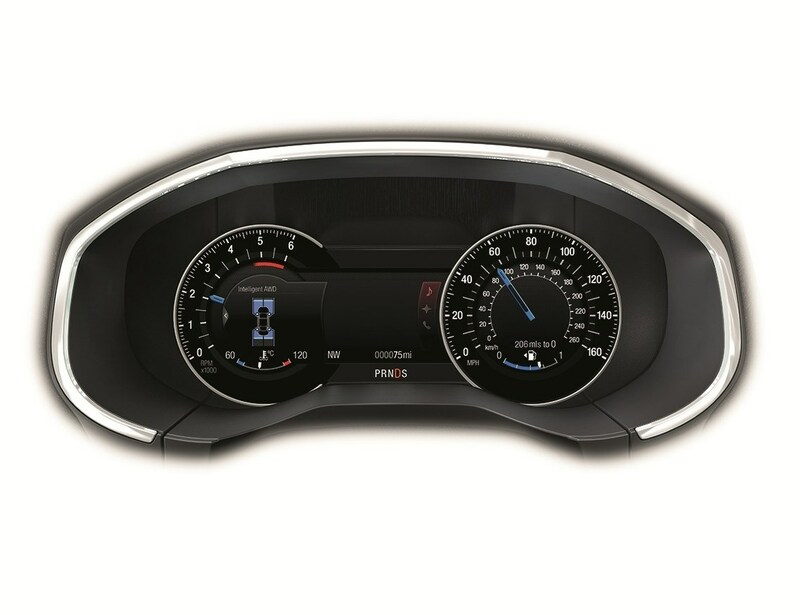 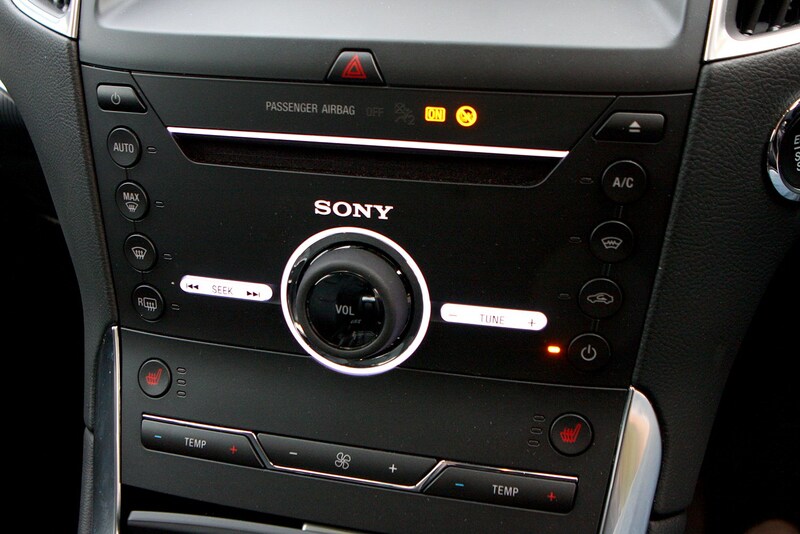 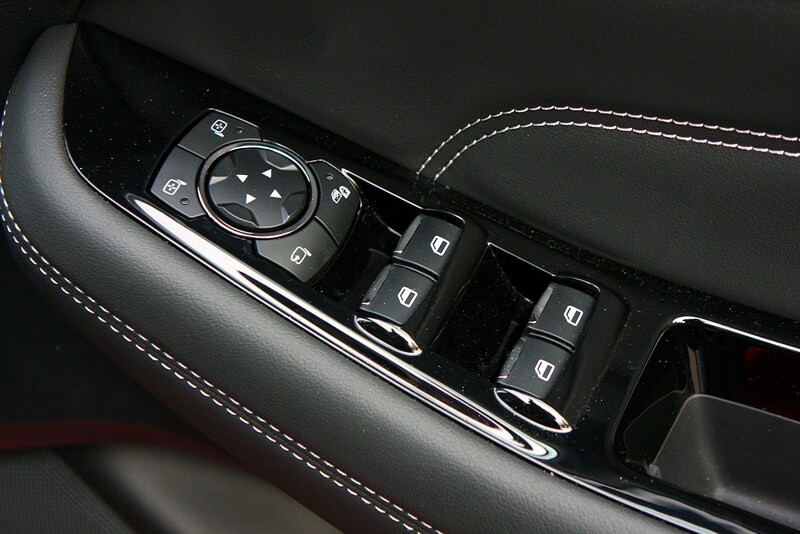 Even the basic cars have 17-inch alloy wheels, an 8.0-inch touchscreen with voice control and Bluetooth connectivity, keyless start, front and rear parking sensors and DAB radio. 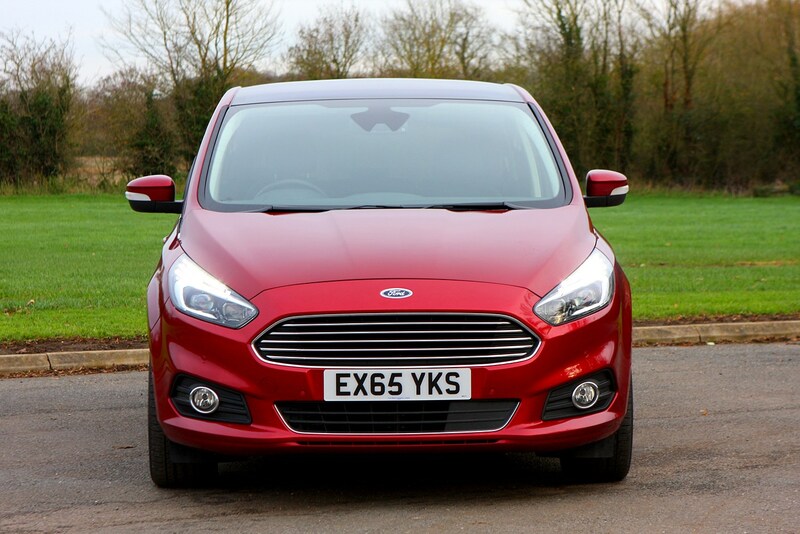 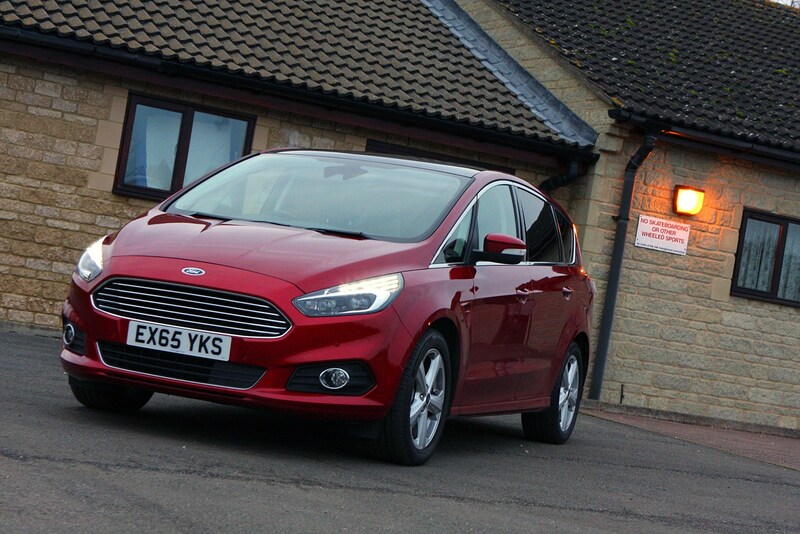 Over and above these Zetec models are the Titanium models, which add niceties such as cruise control, keyless entry and sat-nav. 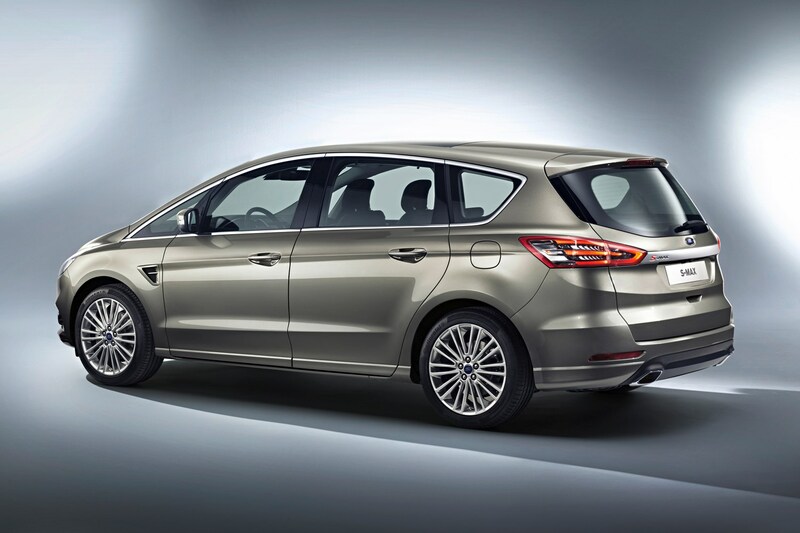 If the standard kit list isn’t enough, Ford will add a Titanium X Pack to Titanium models for more luxury, while there’s an ST-Line Lux Pack to do the same for ST-Line models. 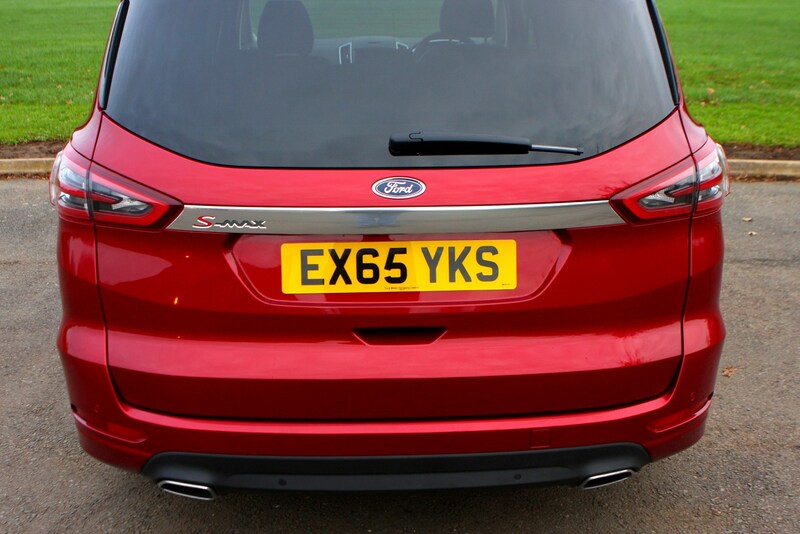 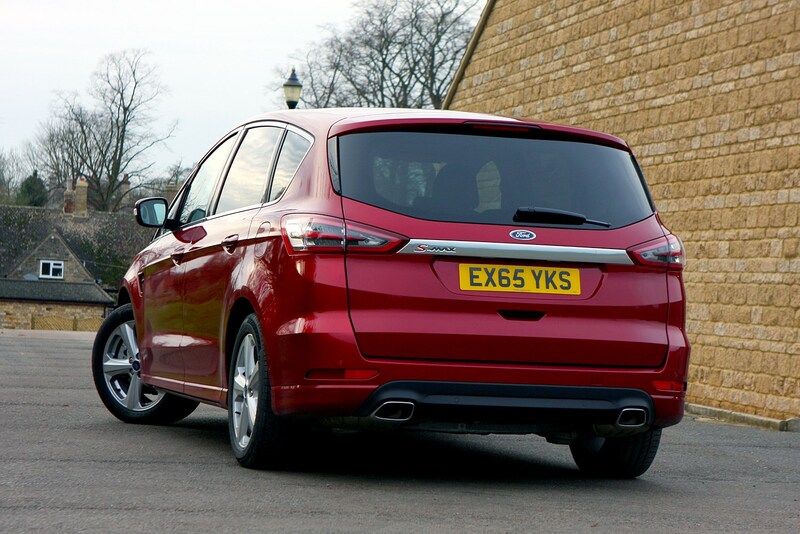 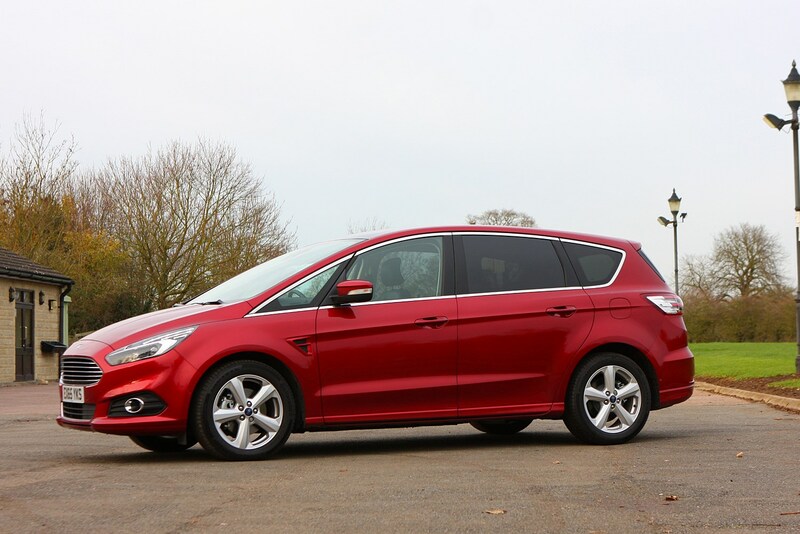 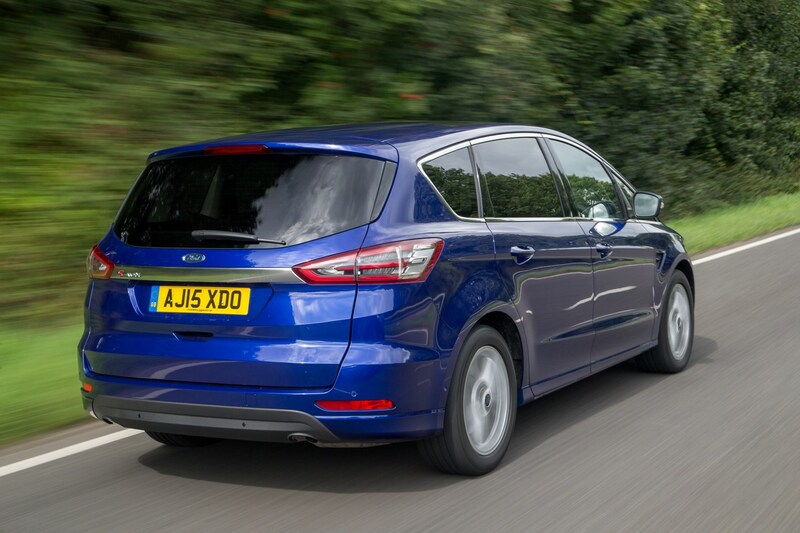 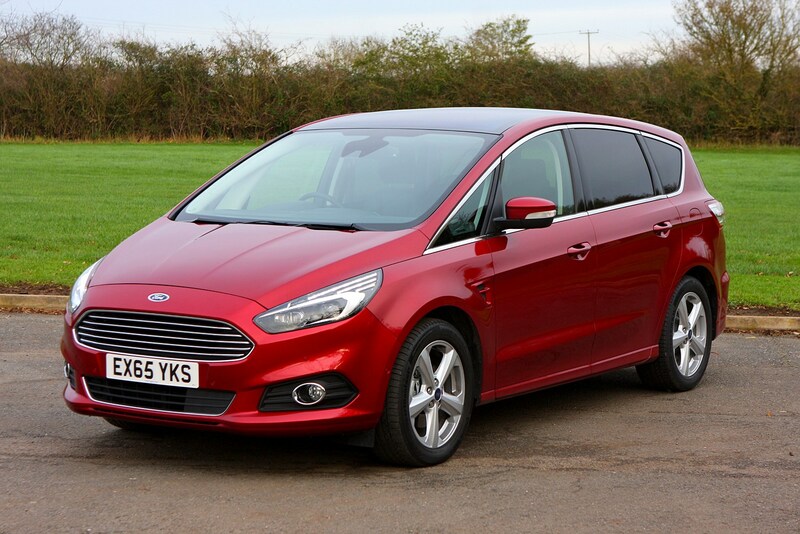 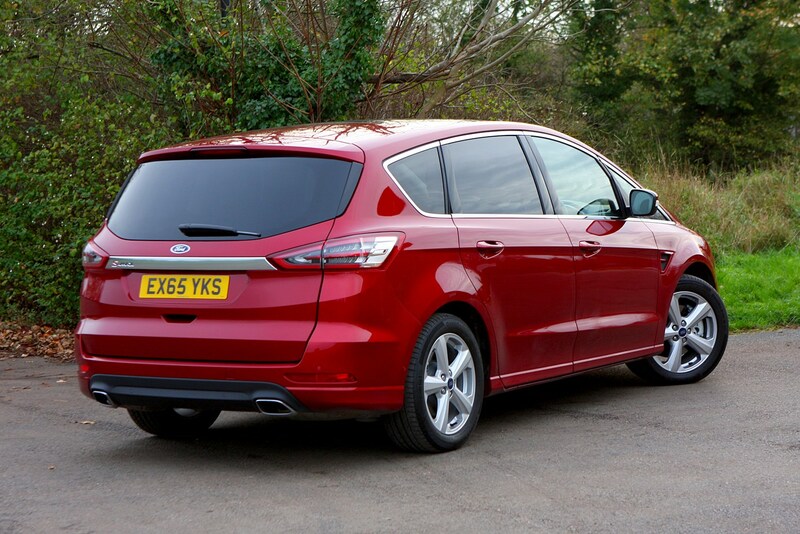 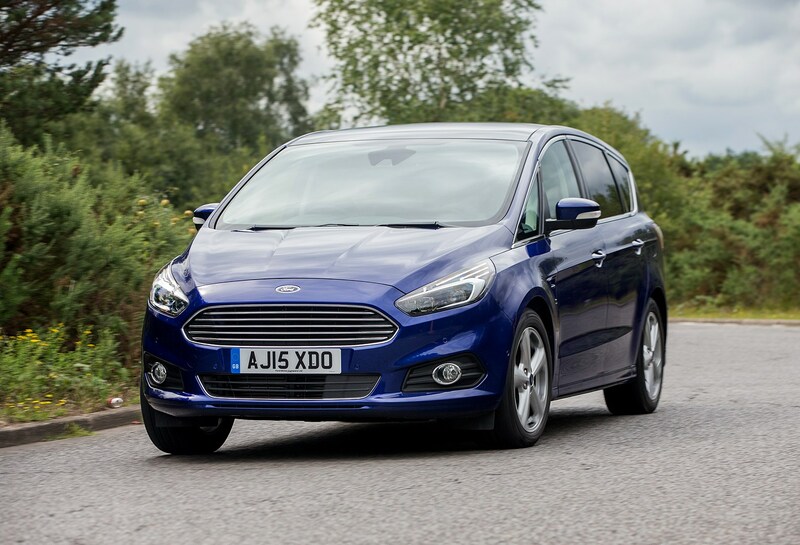 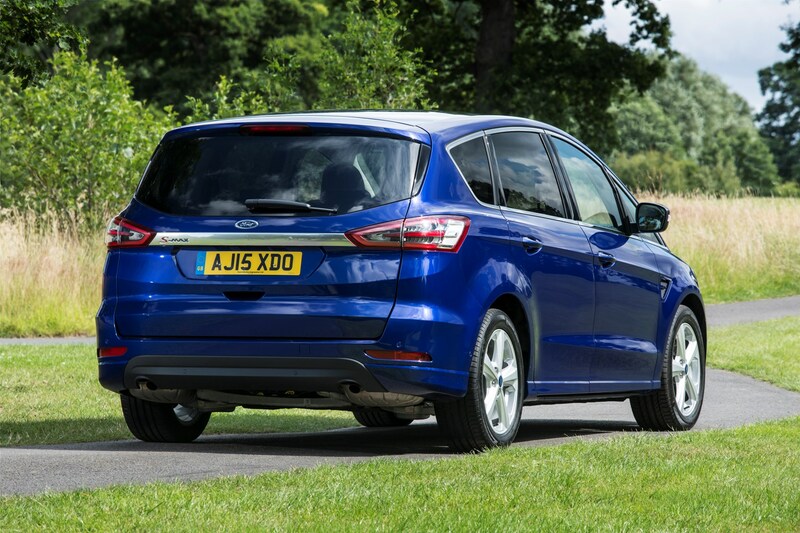 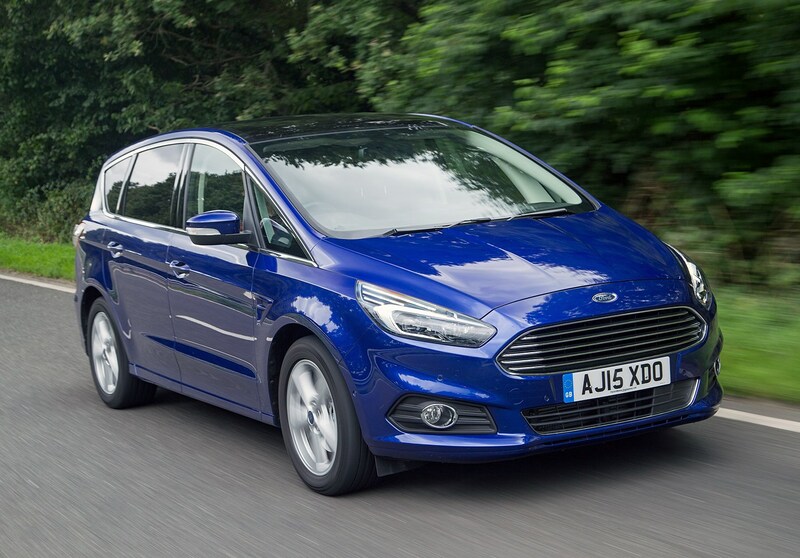 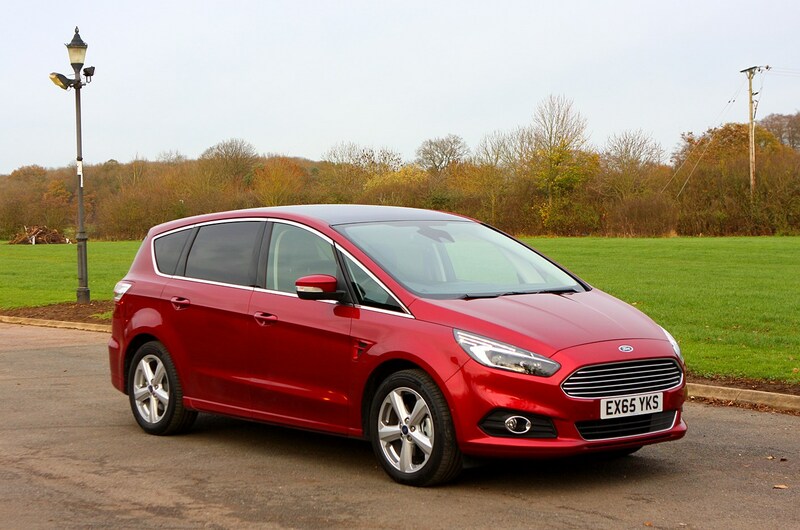 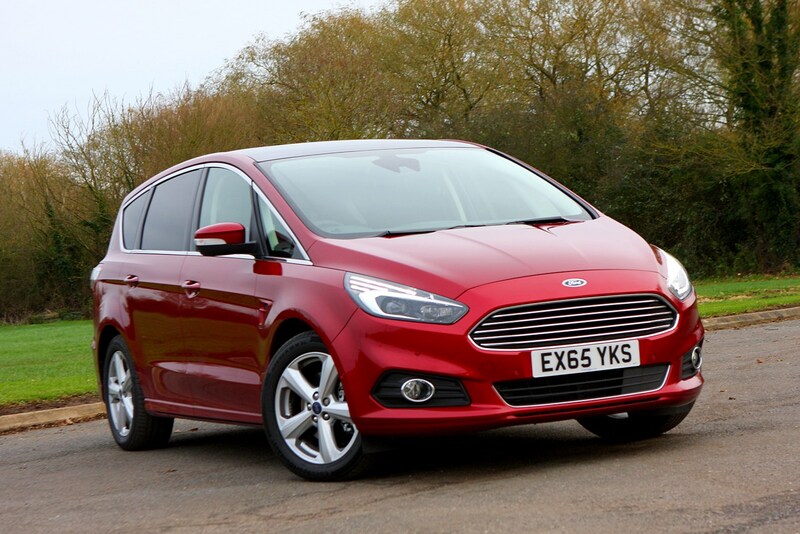 The Ford S-Max has a fight on its hands to compete with other seven-seaters, largely because people who used to buy MPVs like this are flocking to fashionable SUVs in their droves. 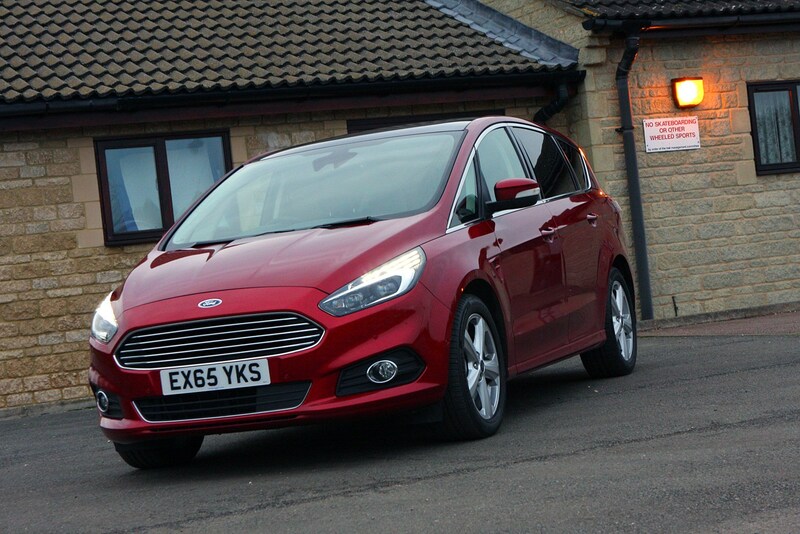 It shouldn’t be overlooked, though, as it offers a practical cabin that’s packed with kit, comfort and a quality feel, while remaining very good to drive at the same time. 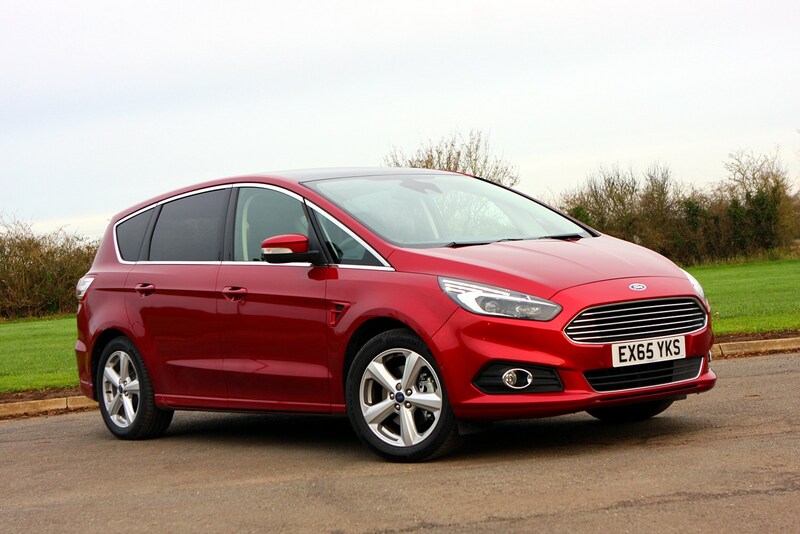 It doesn’t feel like a minibus like some MPVs have a tendency to do. 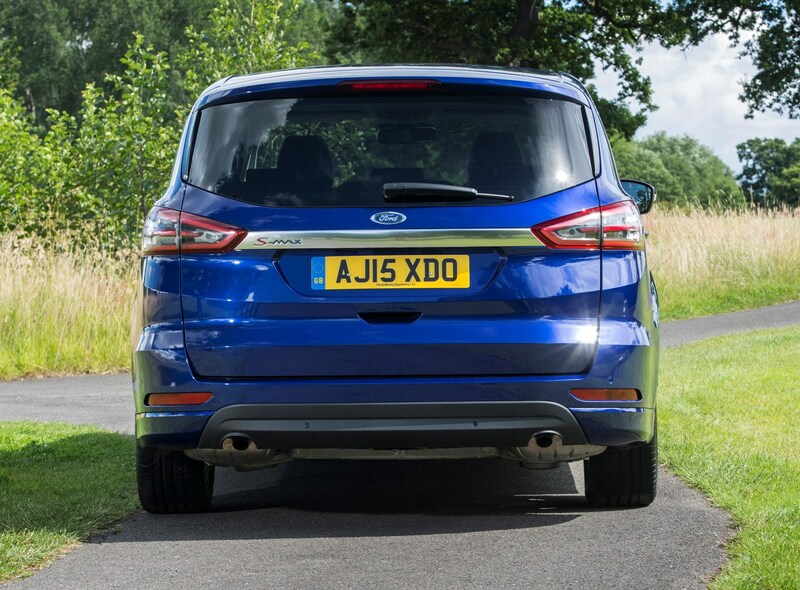 It’s not the cheapest to buy, especially if you want a higher-spec model, but the broad range of engines, gearboxes and trims means buyers are spoilt for choice. 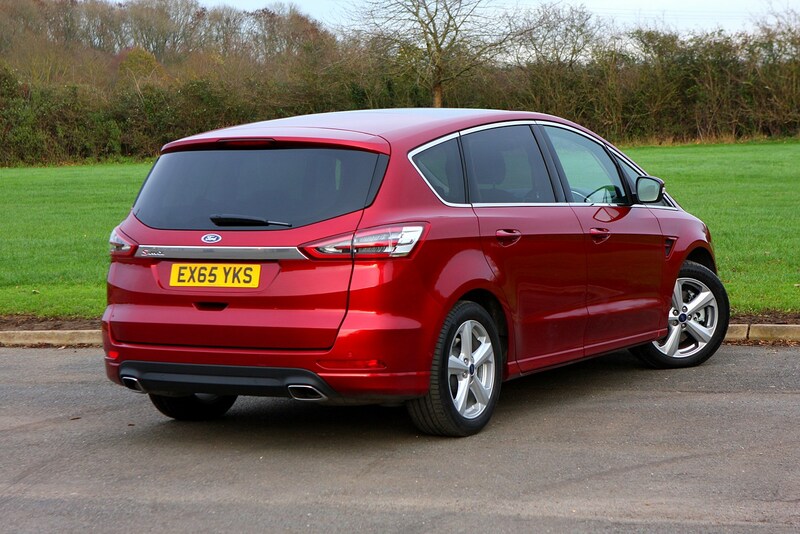 And because it’s a Ford, it’s possible you’d be able to haggle a great deal out of your local dealer.